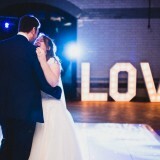 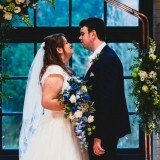 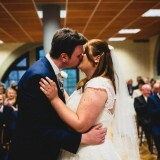 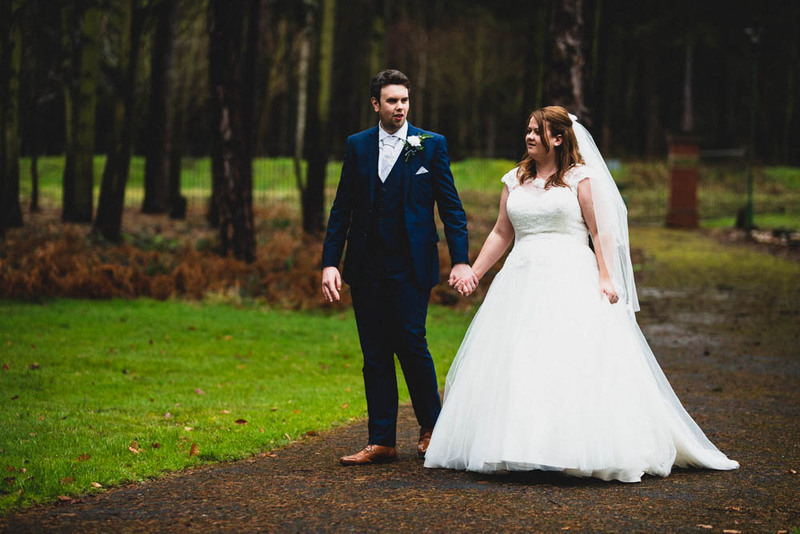 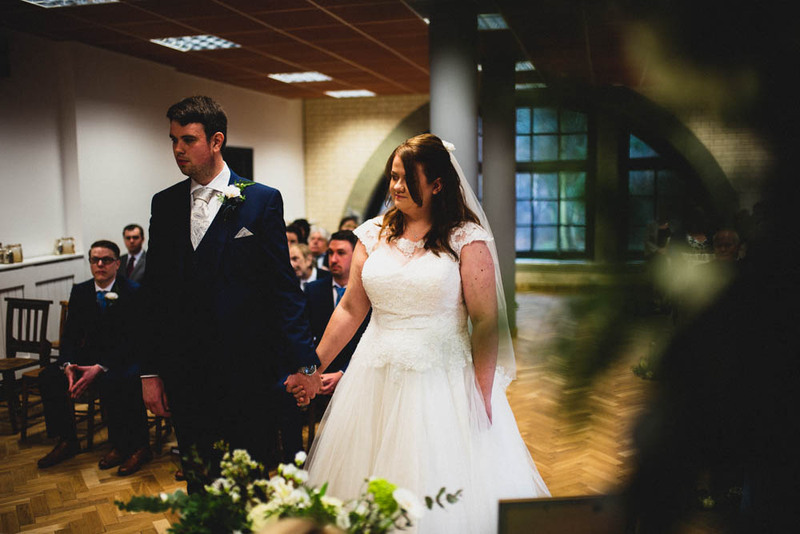 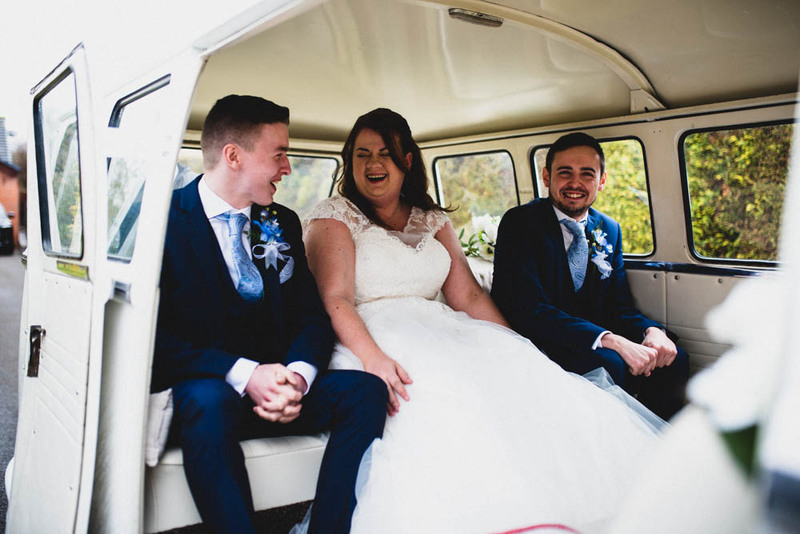 Today’s real wedding couple, Katie and Oliver, wed three years to the day after their first ever conversation, a romantic detail that shows just how much thought they put into the planning of their big day. 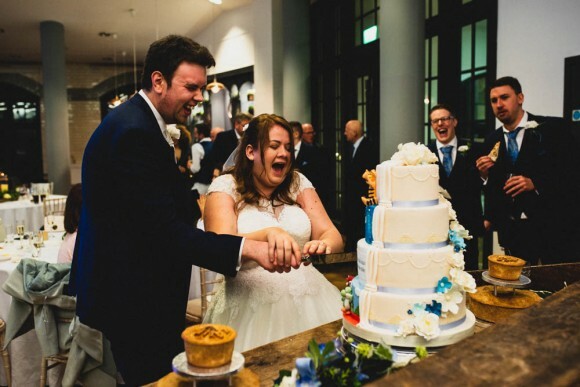 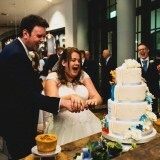 Our favourite detail is the inspired cake – on the face of it a traditional and elegant four-tiered wedding cake but, when spun 180ᵒ, a brilliantly creative concoction featuring some of their favourite things, including a bouncy Tigger! 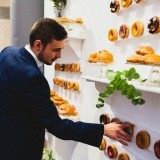 Another delicious detail is the Krispy Kreme doughnut wall – lip-smackingly good sugary treats to sweeten up the guests presented in a clever and contemporary way. 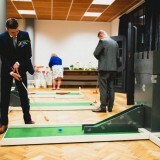 Then, to work off some of those calories, a table football and a nine-hole mini golf course kept the guests entertained before the pizza oven on wheels rocked up. 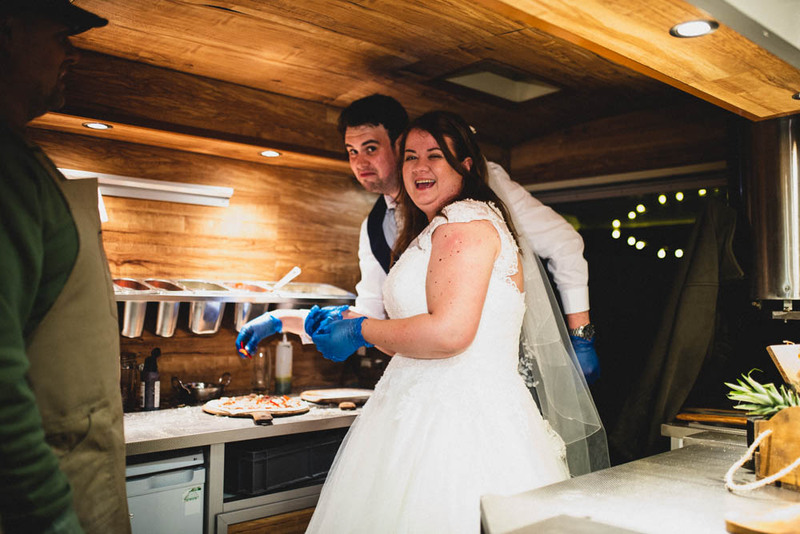 We love the fact that Katie and Oliver pulled on the chef’s gloves (blue, handily, to match their colour scheme!) 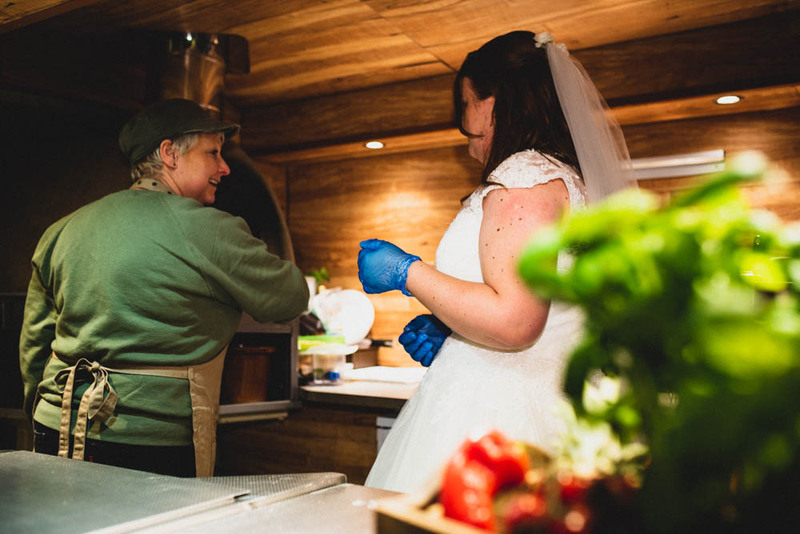 and cooked up their own pizza – their first meal prepared together as a married couple. 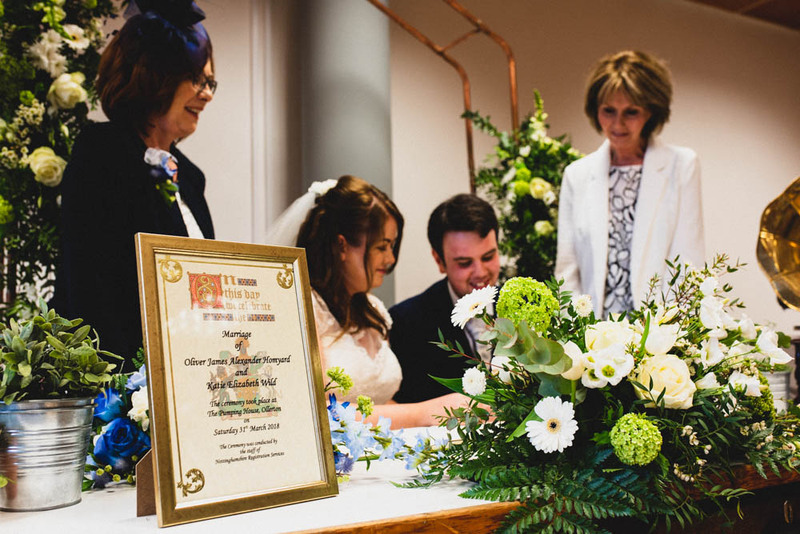 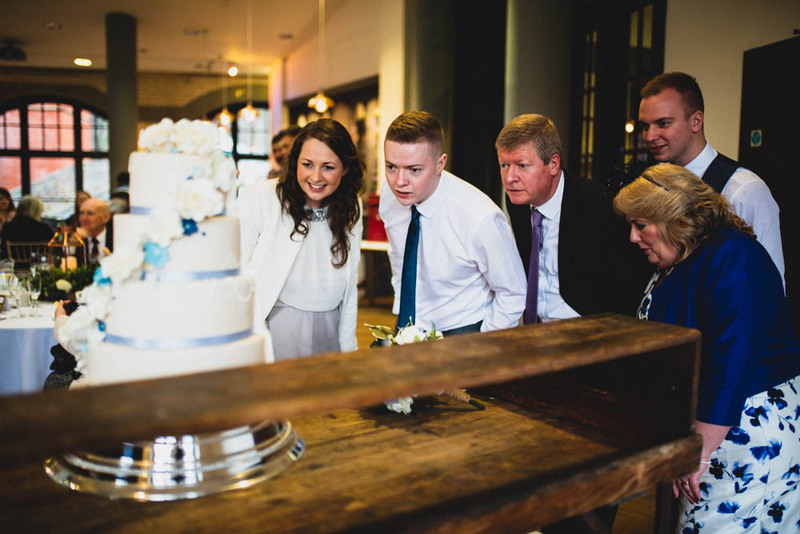 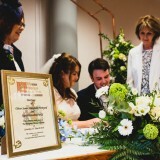 As a special addition to their day, Katie and Oliver had Katie’s grandparents’ lucky horseshoe – symbolising 60 years’ of happily married life – present at the top table and it’s clear from the smiles on their glowing faces that this, too, is a marriage built to last. 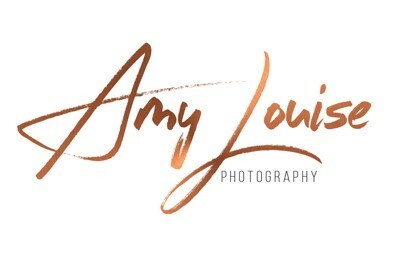 With images by James Morgan. 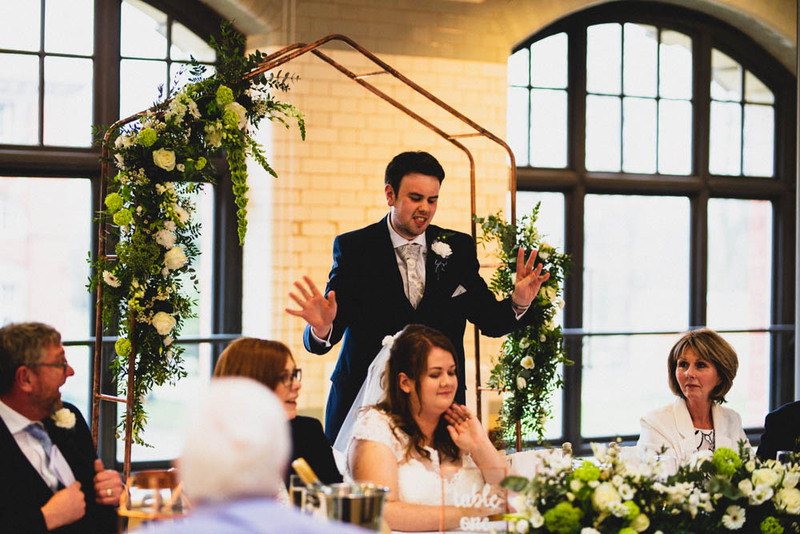 katie says: We got engaged in Lincoln on our two-year anniversary – 6th August 2017. 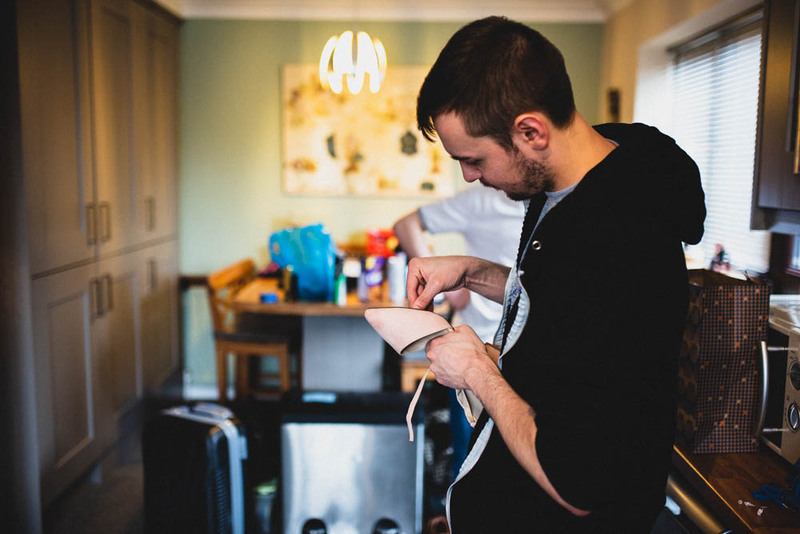 We were going to a hotel at the top of Steep Hill that we’ve stayed at before and Oliver insisted on carrying the suitcase rather than taking it in turns. 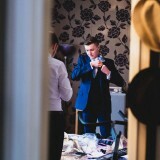 He also insisted on unpacking while I had a drink on the little terrace outside. 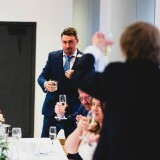 He came outside with two glasses of champagne and got down on one knee (I felt bad for being suspicious that he wouldn’t let me pack earlier that day!). 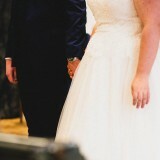 He took me to Marco Pierre White’s restaurant afterwards for dinner and cocktails, where everyone was lovely and made a huge fuss. 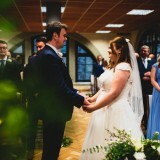 We got married on 31st March 2018, three years to the day after we first spoke. 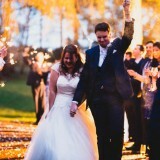 We needed a date that was in the school holidays (life of a teacher!) 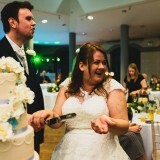 and it seemed fate that the venue we wanted had that date available. 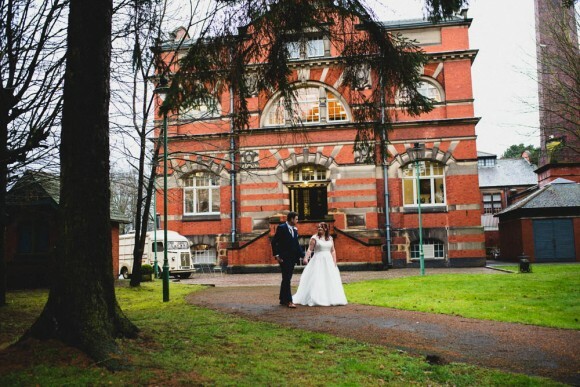 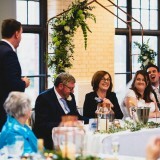 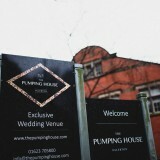 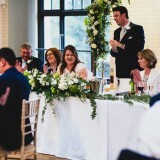 Our venue was The Pumping House in Ollerton, Nottinghamshire – we had our ceremony and reception there. 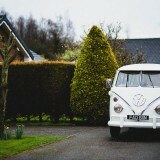 We went to look round and, once we’d set foot inside, it was the only choice. 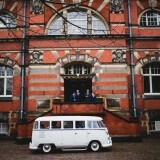 It was modern but not clinical and had heaps of character but wasn’t trying too hard. 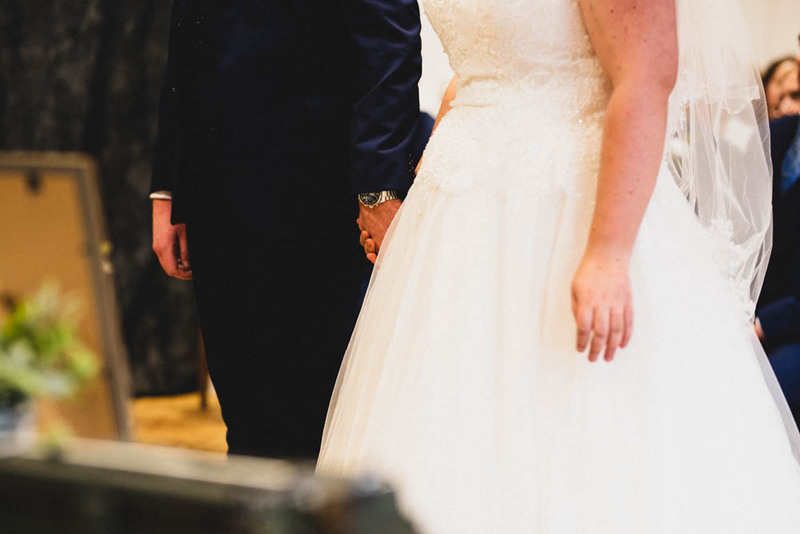 It was unlike anything we’d ever seen before. 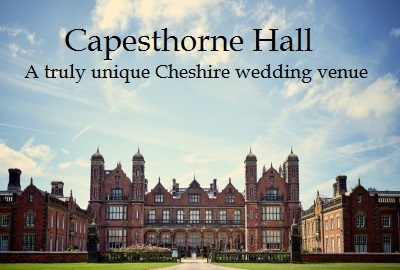 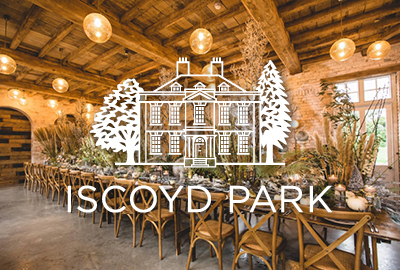 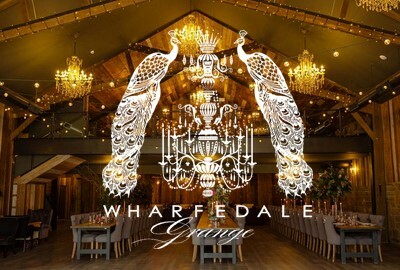 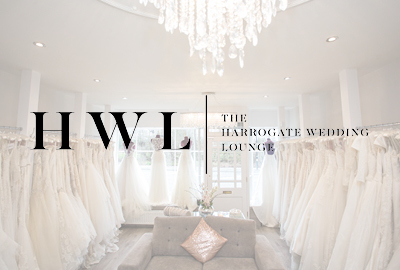 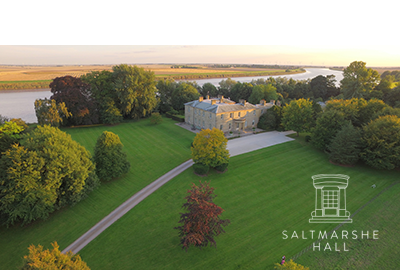 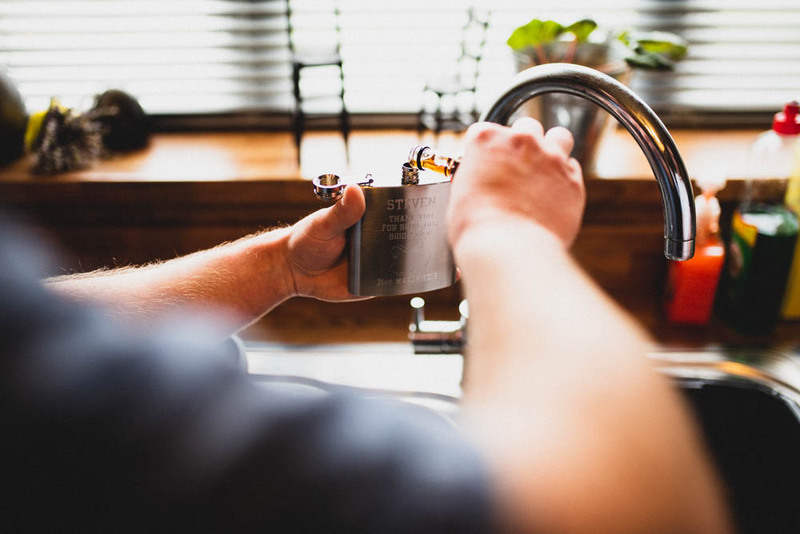 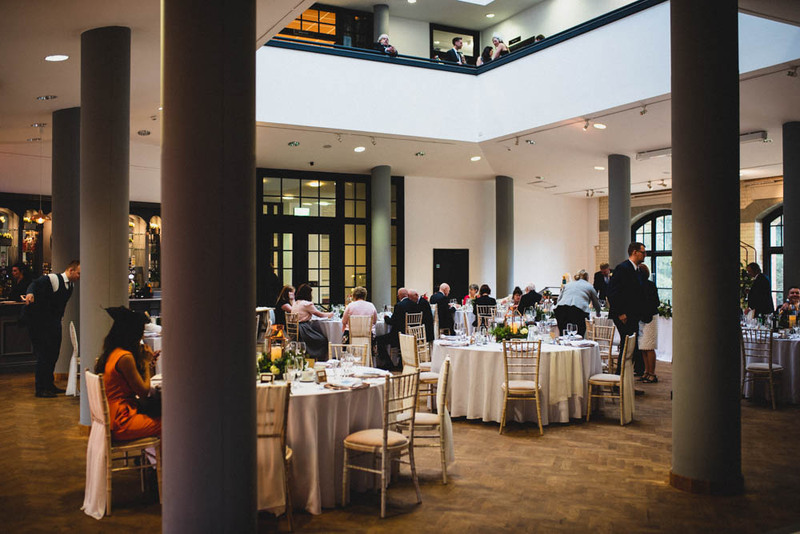 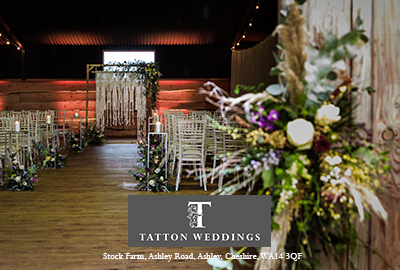 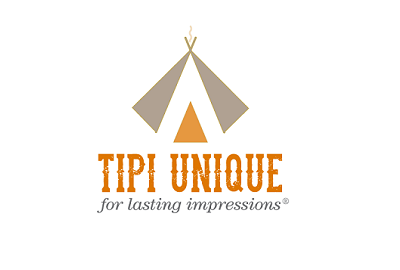 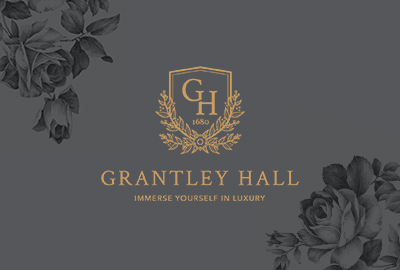 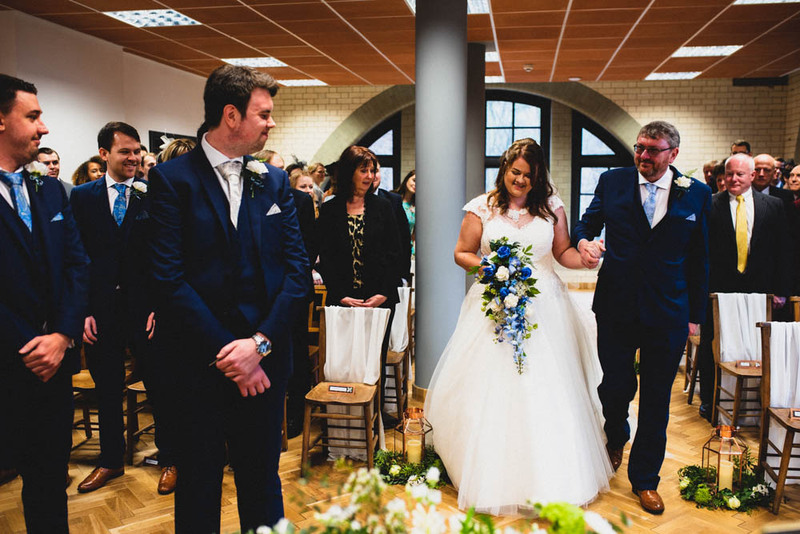 We would completely recommend the venue – Joanne, Amie and the team are so personable and lovely that we felt really looked after in the run-up to and on the day. 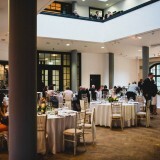 It is genuinely one of the most unique venues we’d ever seen and everyone who was part of our wedding commented on its originality. 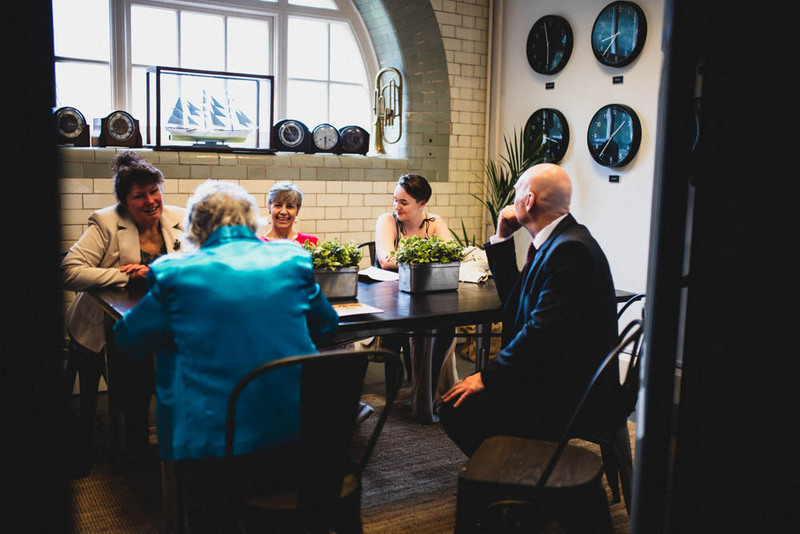 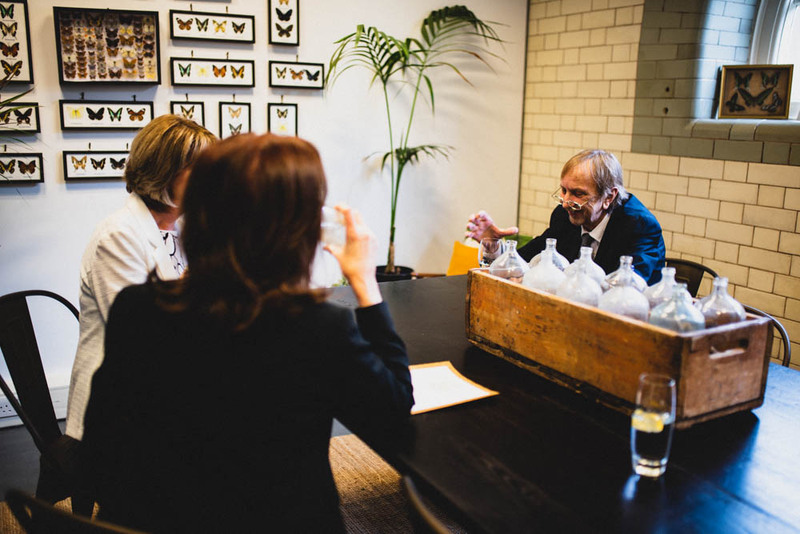 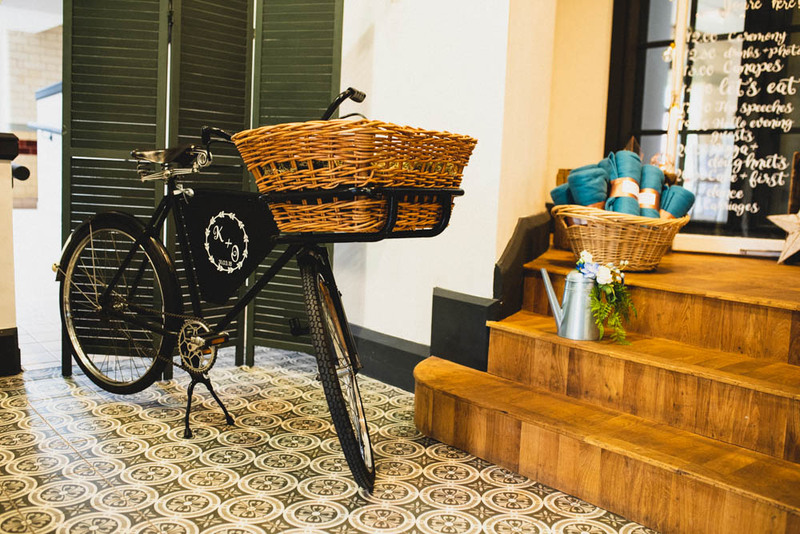 Although it is a large space, it feels cosy with all the individual rooms and little spaces that make it up, and the accommodation they have that is exclusive to those booking the venue completely blew our guests away. 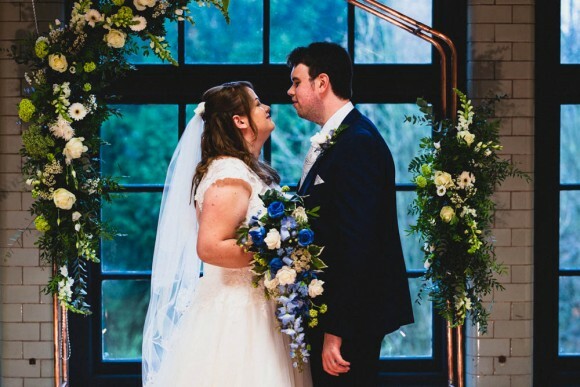 We didn’t choose a specific theme but we wanted it to be very ‘us’. 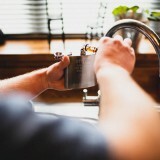 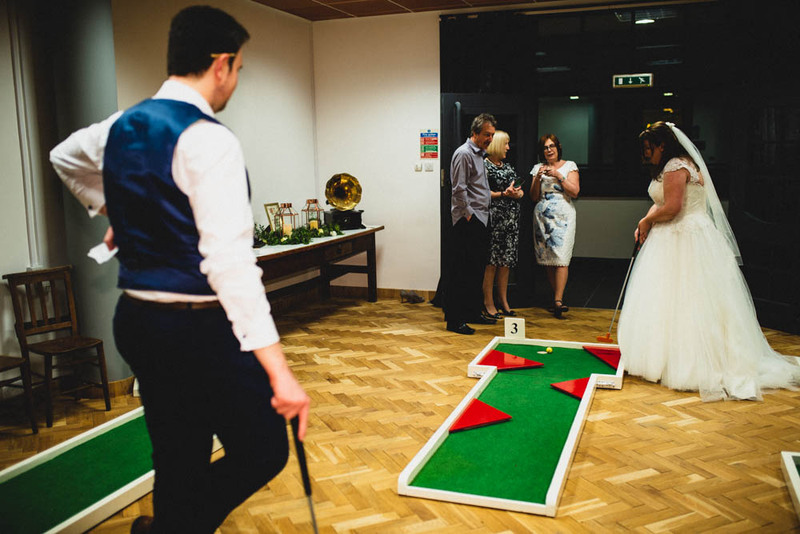 Neither of us are that traditional and we wanted to make sure we had a great time and that there was something for all of our guests. 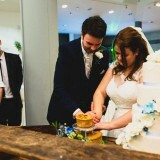 It also reflected the things we have done since we met, which was unintentional but nice! 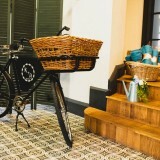 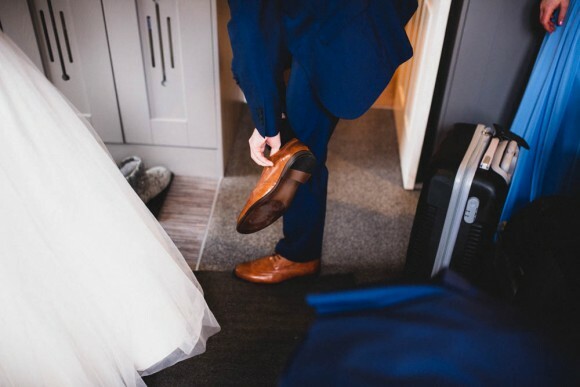 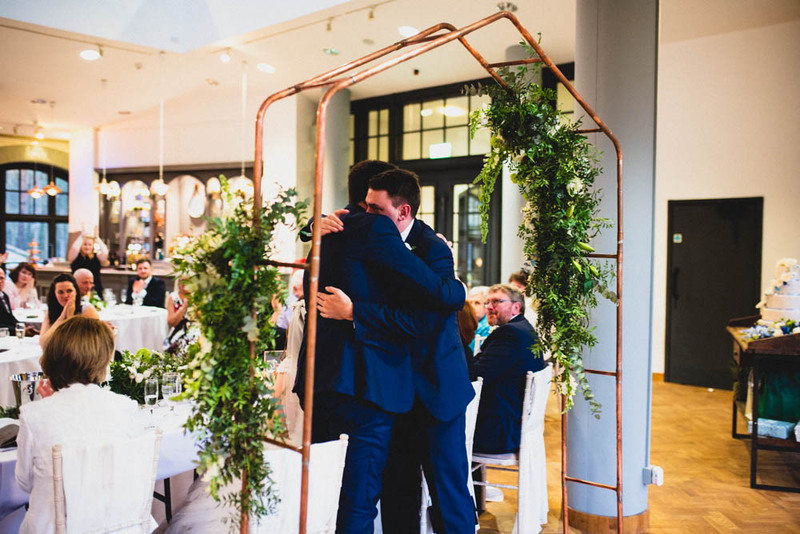 Colour-wise, we chose different shades of blue for the bridesmaid/bridesmen and groomsmen and, for the venue, we kept things fairly neutral with lots of copper, greenery and simple white flowers, as we wanted the venue to speak for itself. 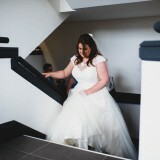 When it came to my dress, I chose the first one in the first shop we went to. 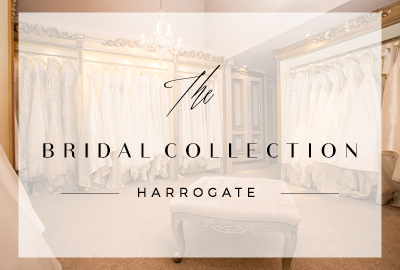 I went with my mum to Mirage Couture in Kiveton, where Lindsey and Janice were lovely. 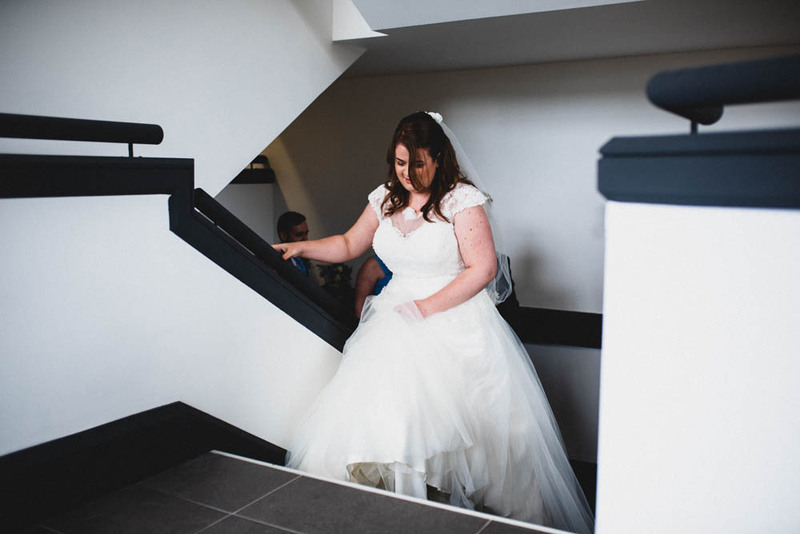 I only picked one dress to try on and it fitted perfectly – I then tried on two more just to double check but kept going back to the first. 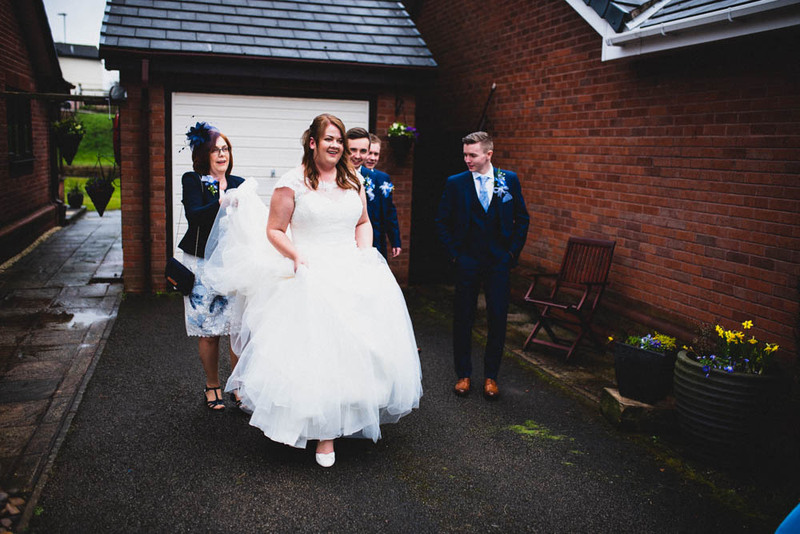 It was by Callista Bride (Monet style) and I loved the fact that it was comfortable and flattering but still traditional and timeless – I didn’t want to look back at the photos in 20 years’ time and think it looked dated. 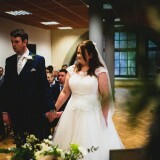 My maid of honour, my mum and I had our hair and makeup done at Ego in Worksop. 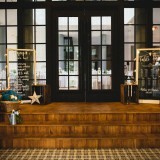 They were fantastic and opened up early to accommodate us. 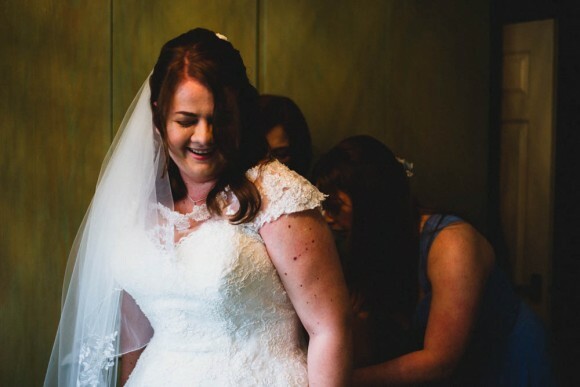 Lizzie, who did my make-up, was great at giving tips to keeping it fresh all day and Heather made sure that my hair was polished but that I still looked like myself and it wasn’t over the top, which was important to me. 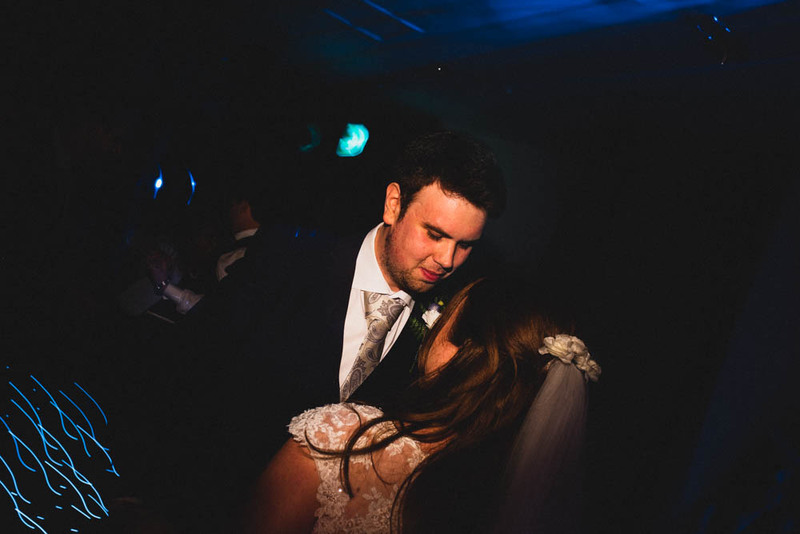 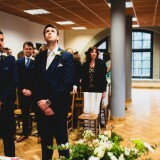 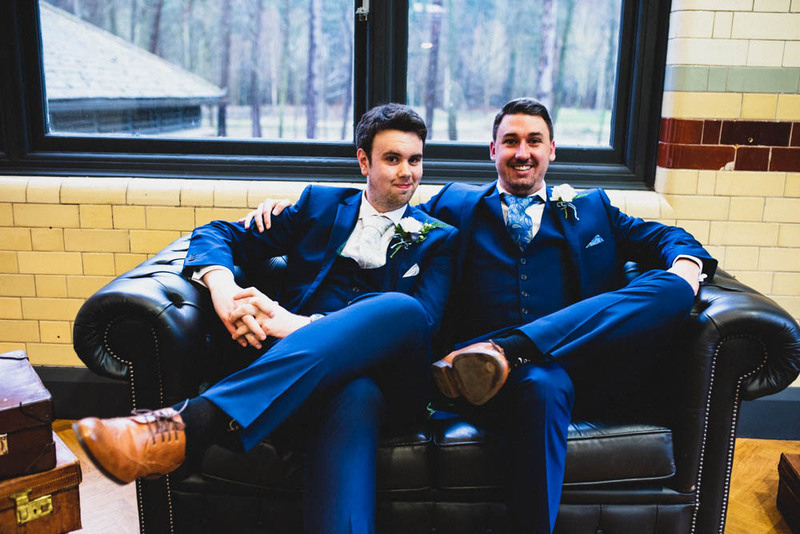 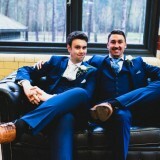 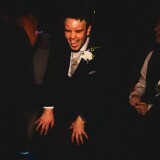 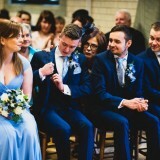 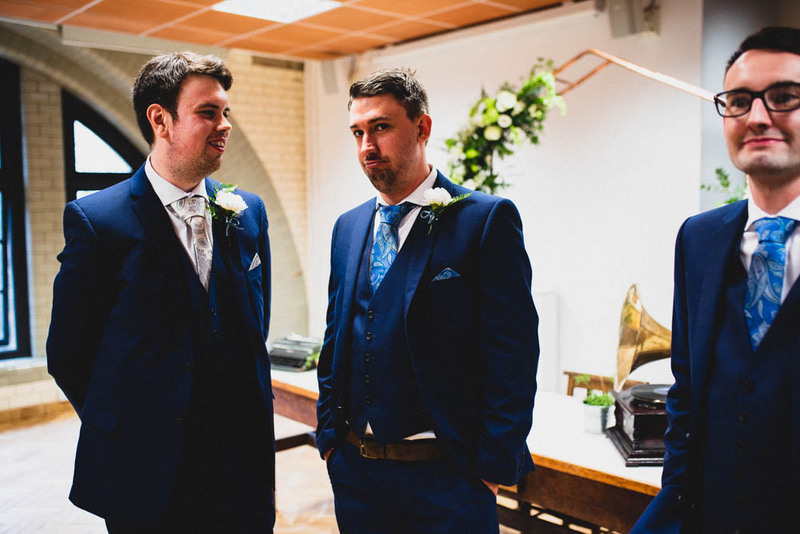 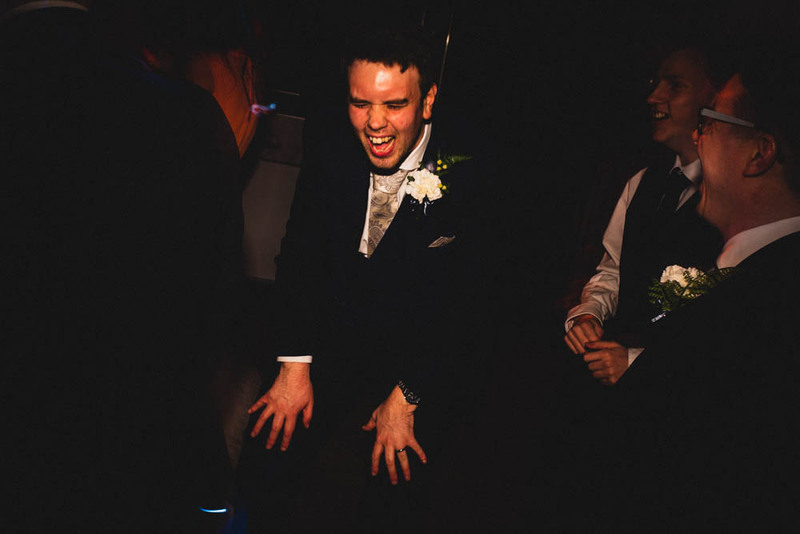 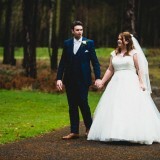 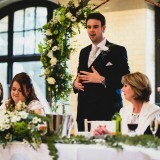 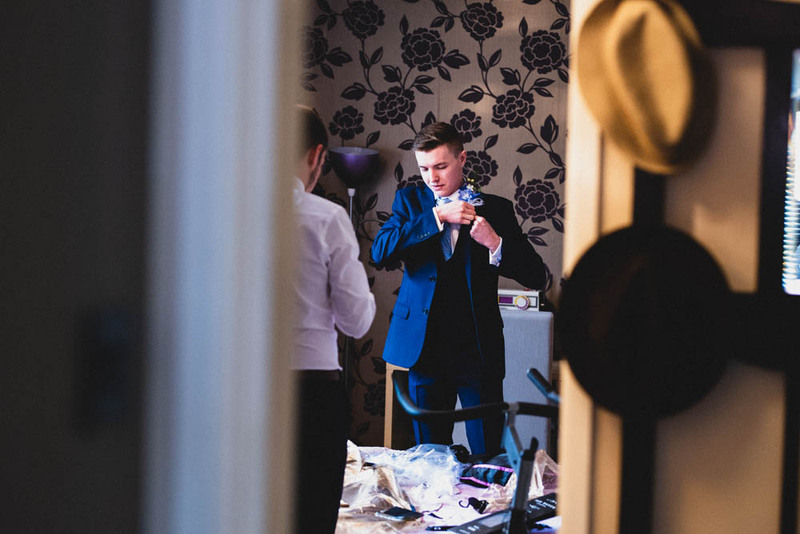 Oliver’s suit was hired from Moss Bros – it took so much longer to sort his suit than my dress! 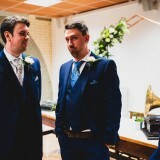 It was a Ted Baker Lounge Lizard three-piece – he wears a suit to work so wanted something special for the day but not a top hat and tails. 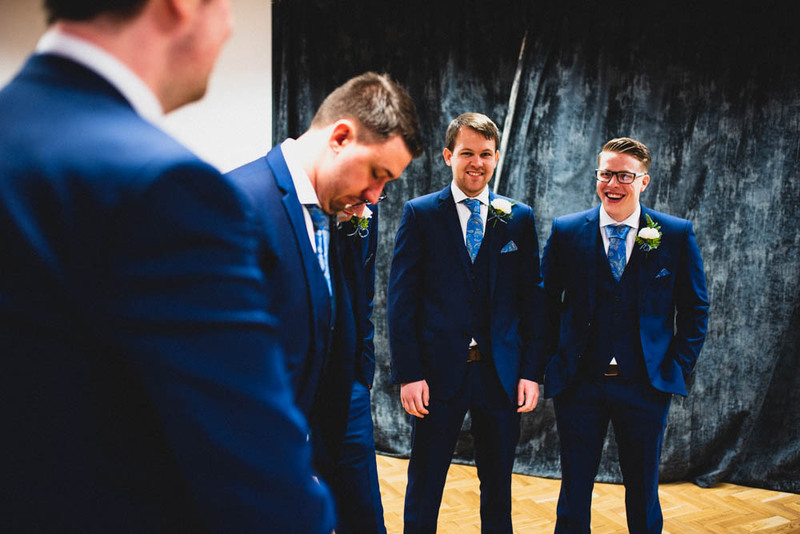 The only difference between his and the bridesmen/groomsmen was the colour of their ties. 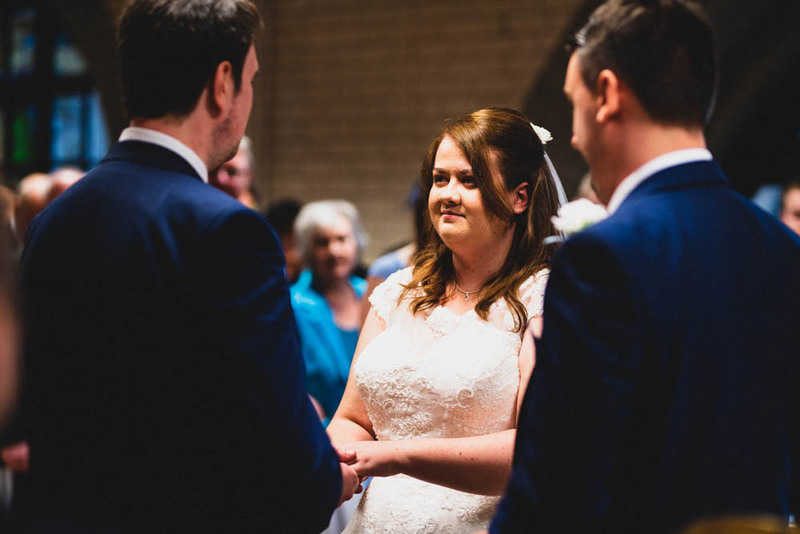 I had one female bridesmaid – my maid of honour Nicola. 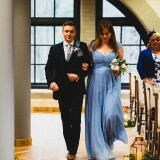 She wore a floor-length Pantone-blue dress by Dessy that we ordered from Mirage Couture. 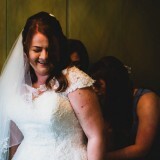 I wanted to make sure she loved what she was wearing as she would be the only woman in the bridal party! 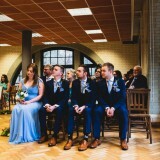 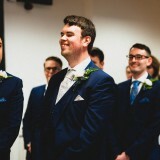 My bridesmen and Oliver’s groomsmen wore the same suit as Oliver, but the bridesmen’s tie was the same blue as Nicola’s dress and the groomsmen wore royal blue ties. 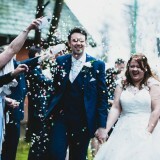 It sounds bonkers but looked perfect on the day! 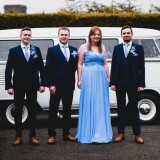 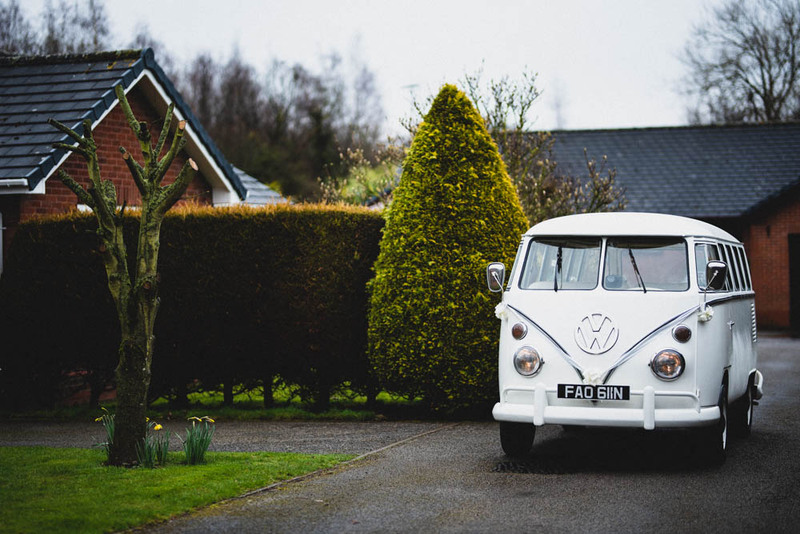 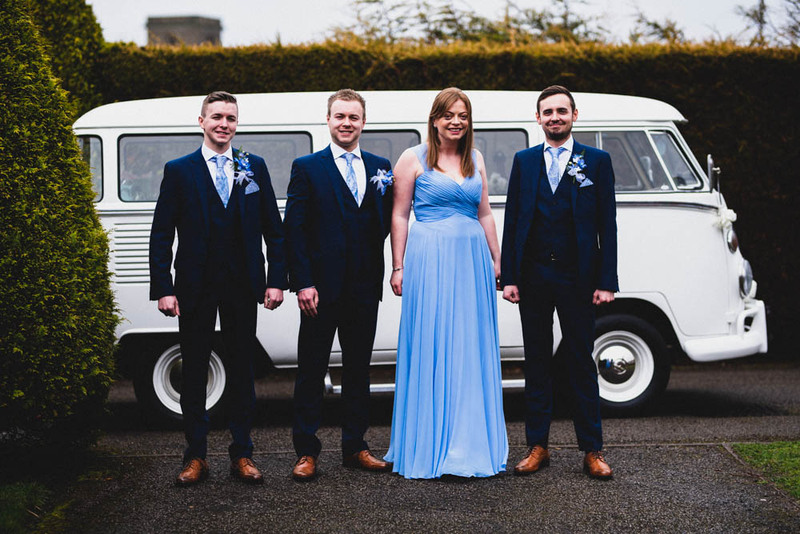 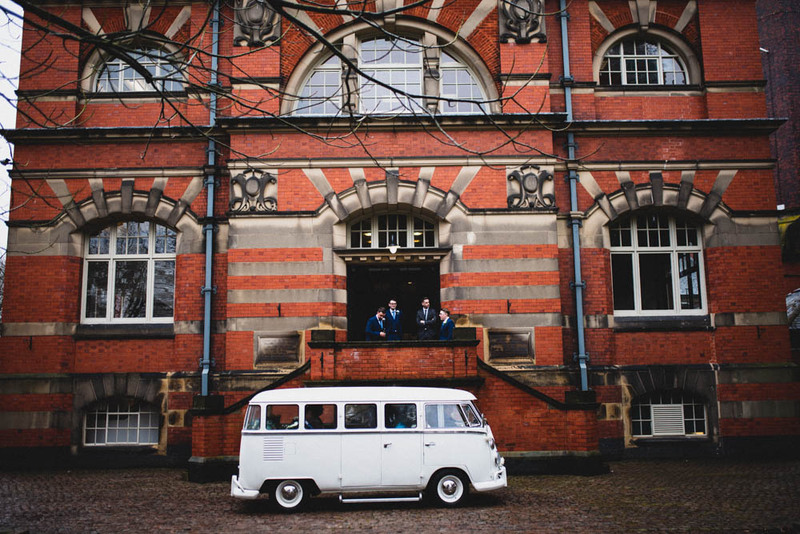 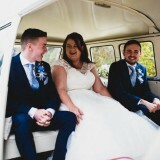 As transport, we hired a VW campervan from the Yorkshire Wedding Car Company – it took eight of us (me, my bridal party, my parents and my grandma) to the venue and we had so much fun getting there! 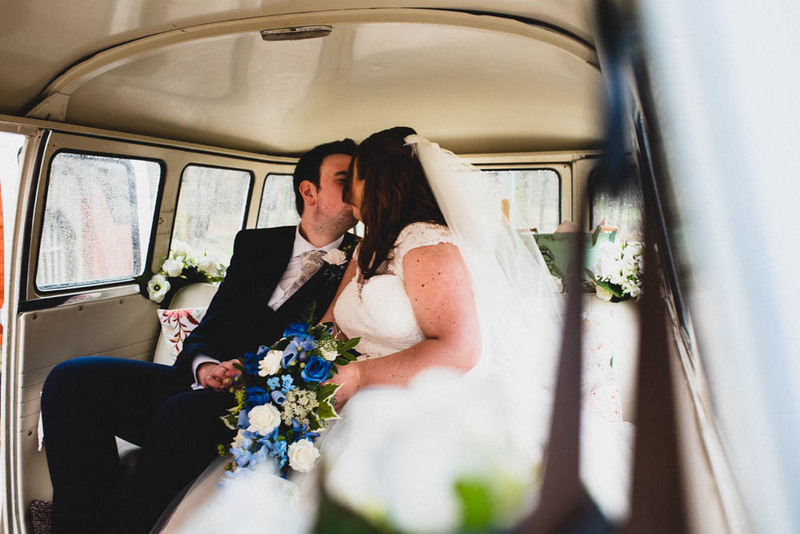 Paul, our driver, was very understanding when I forgot my flowers and we had to go back to get them, and it was fantastic for us all to go together. 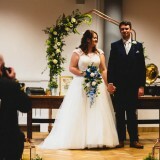 James Morgan was our photographer and I would recommend him to take photos for any occasion. 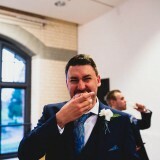 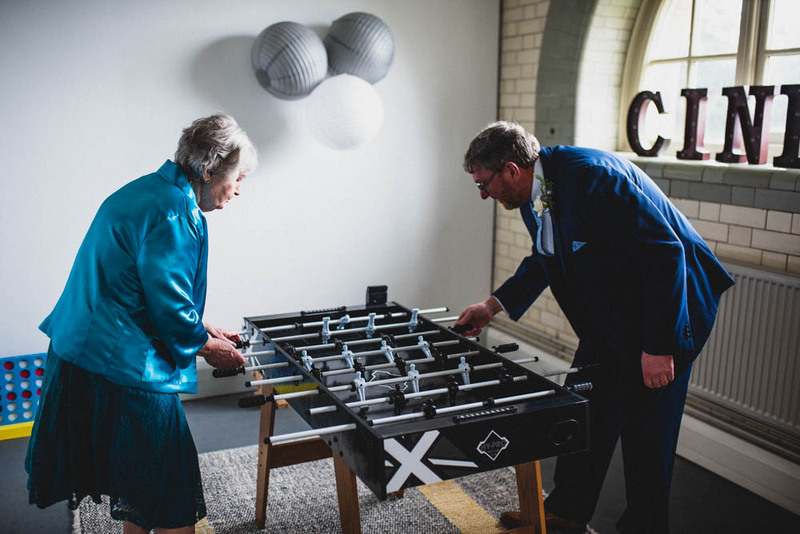 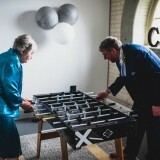 I genuinely hate having my photo taken and he was so laid back and relaxed throughout the whole thing – the photos were fantastic, and he captured moments we didn’t even know about (my grandma and stepdad playing table football is one of my favourite moments that we didn’t actually see until the photos arrived!). 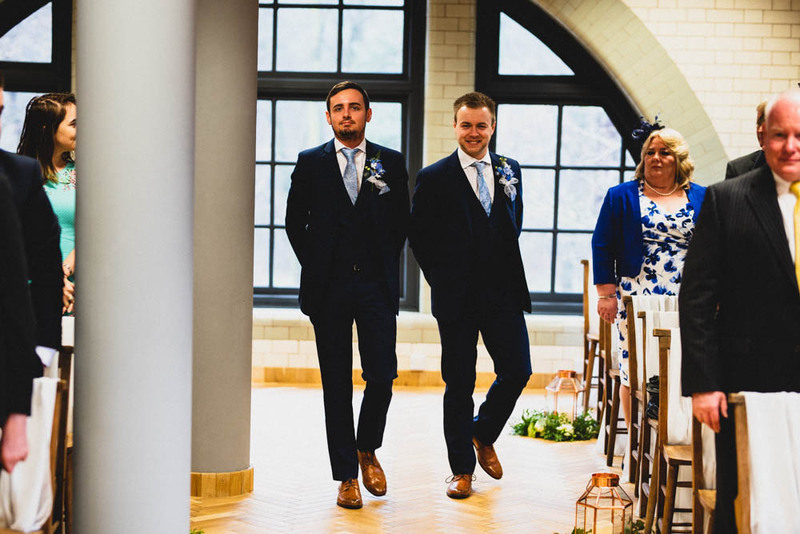 Our family and friends were given a taste of the photos on the day on a slideshow after the wedding breakfast and we were all desperate to see the rest, which arrived within two weeks! 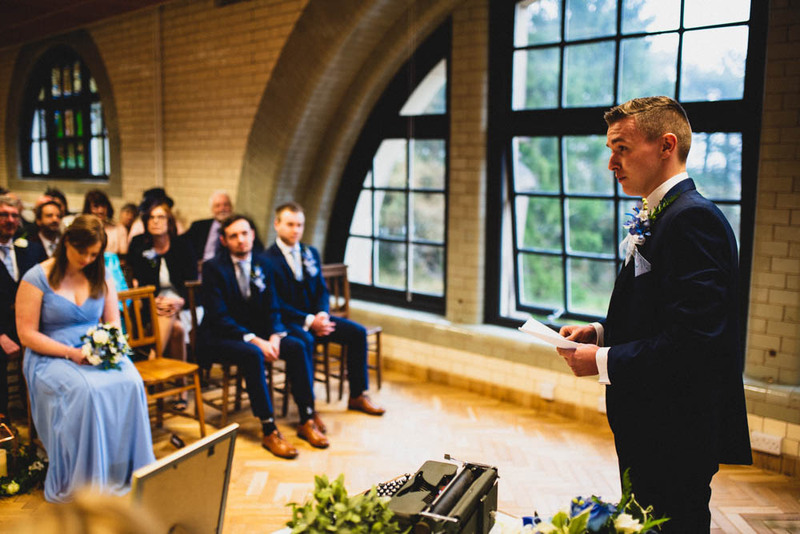 We didn’t use a videographer; however, James interspersed our photo slideshow with short video clips he’d filmed, which was a lovely surprise. My flowers and my maid of honour’s bouquet were both made by my mum from silk flowers because I wanted blue involved and that is very difficult to do with real flowers. 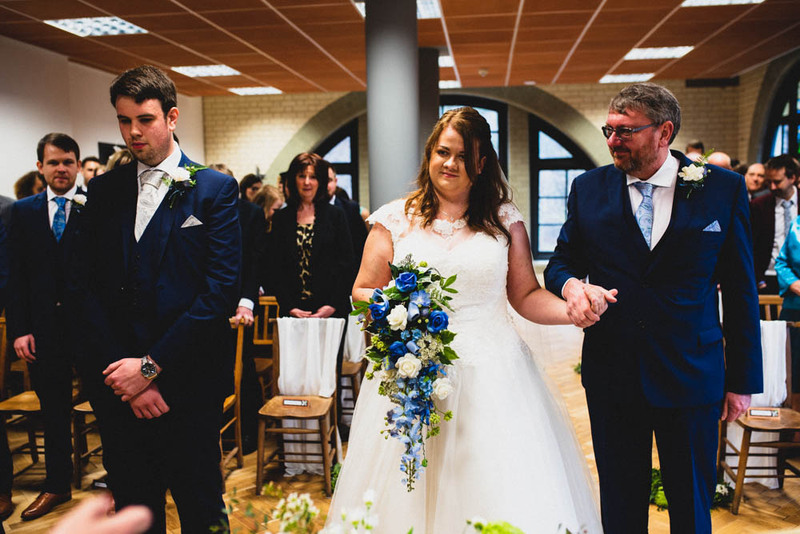 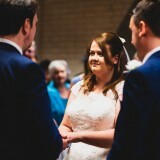 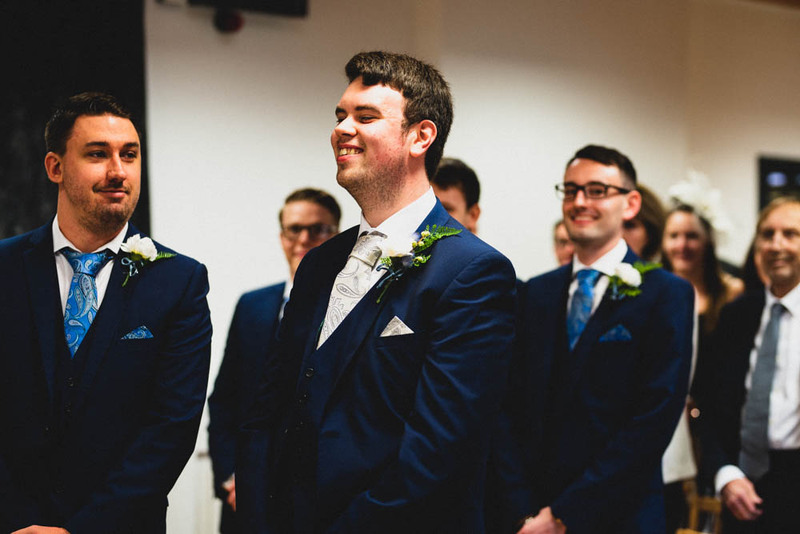 She also managed to weave my grandad’s tie into them – he was originally going to walk me down the aisle along with my stepdad but unfortunately passed before the big day. 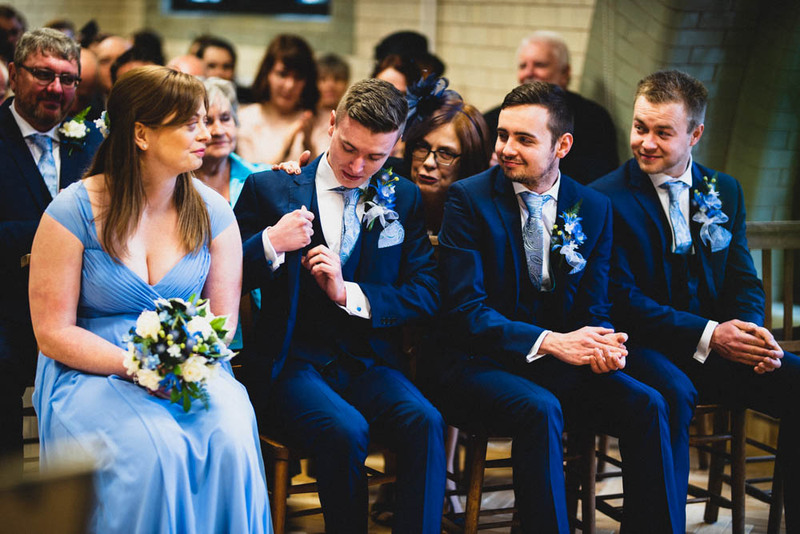 It was the tie he was planning on wearing and happened to be the same one he’d worn to my parents’ wedding five years prior, so it was a really special touch. 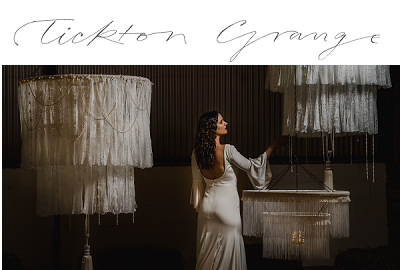 Save the Date Event Stylist worked with us to decorate the venue – we had an idea of what we wanted but went into their showroom and put together a really cohesive idea with their input. 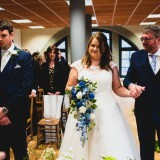 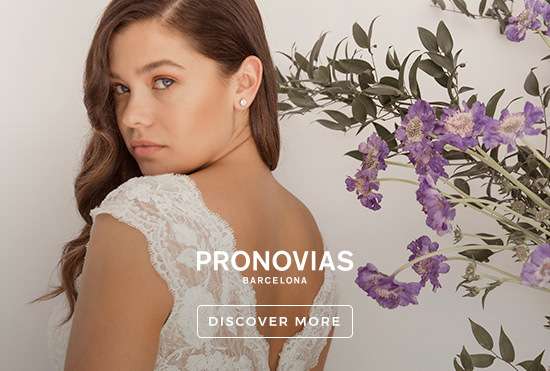 They suggested we use peonies and plumes for the flowers and Danielle was fantastic – we wanted really simple and classic and she understood us completely. 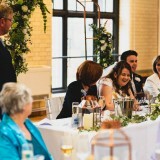 Some parts of the venue we arranged ourselves – small things such as brightly patterned umbrellas (just in case of that wonderful British weather!) 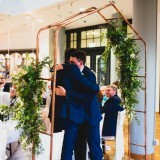 and blankets, as well as copper-coloured charger plates for the table (I’m so picky and found the exact ones I wanted in a shop, so I purchased them myself). 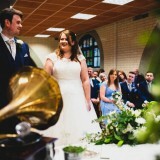 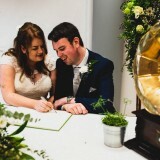 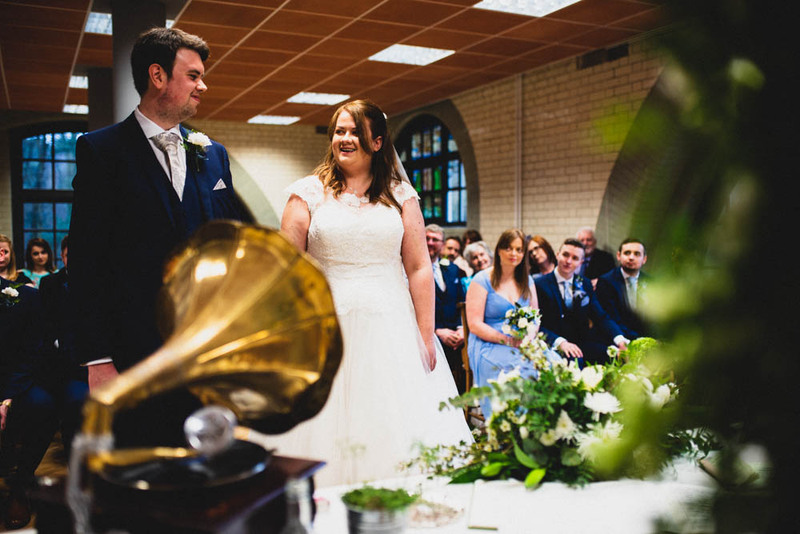 We had favours that we’d made ourselves – CDs with the music from the wedding service. 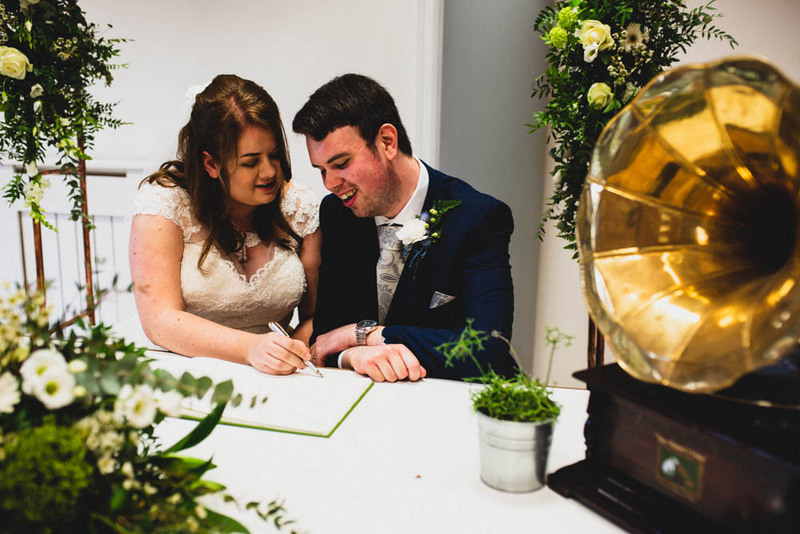 Both of us love music so much and it seemed fitting. 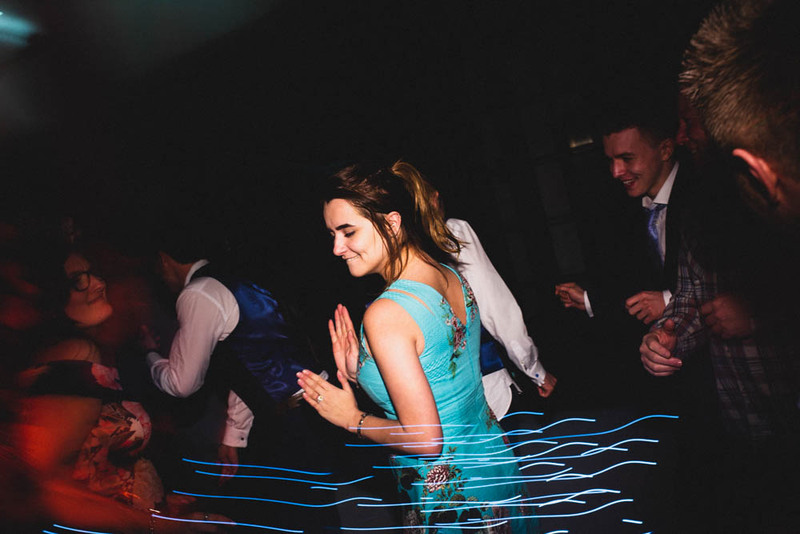 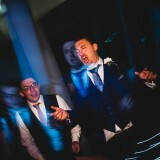 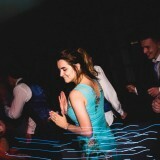 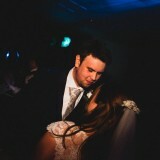 It was everything from the music the guests settled in to until our first dance song. 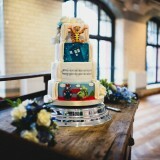 It was a labour of love but everyone said it was really original. 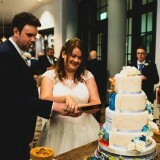 Our cake was made by Haley Maycock from Cake Expectations, based in Dinnington. 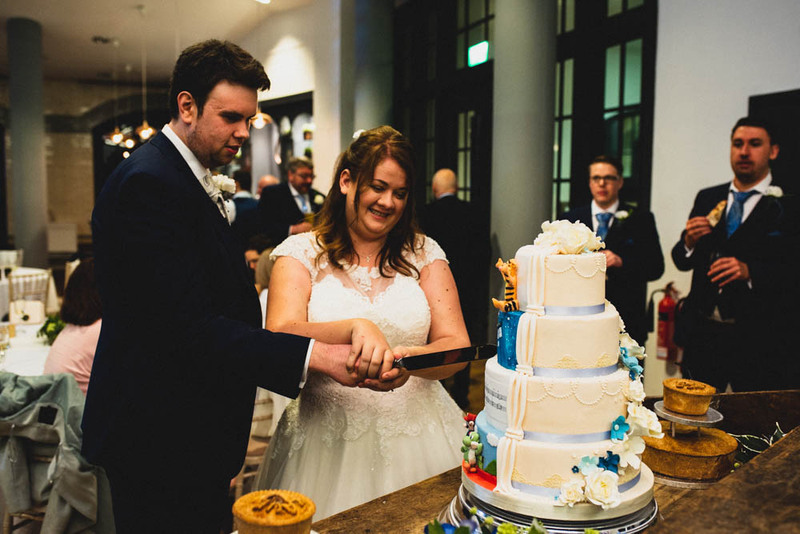 We’d looked online for someone who could do a cake with a bit of a twist – we both wanted a cake with a ‘hidden reveal’ at the back, but a lot of people did quite simple designs for this style. 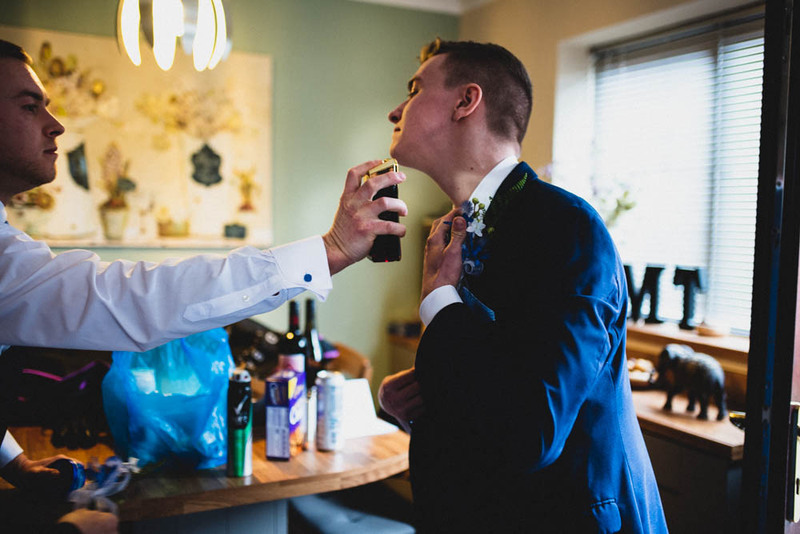 Haley sent us samples to try (Oliver loved that day!) 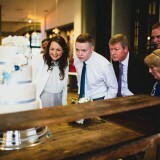 and then met with us to design the cake. 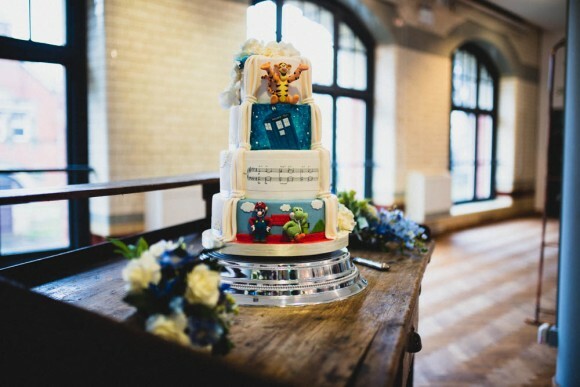 We were really keen on having things that were symbolic to us on the back (although I think some people would be baffled with a Tigger, Dr Who, sheet music and Mario and Yoshi!) 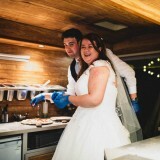 Neither of us can draw, so we took images we’d printed to give her an idea. 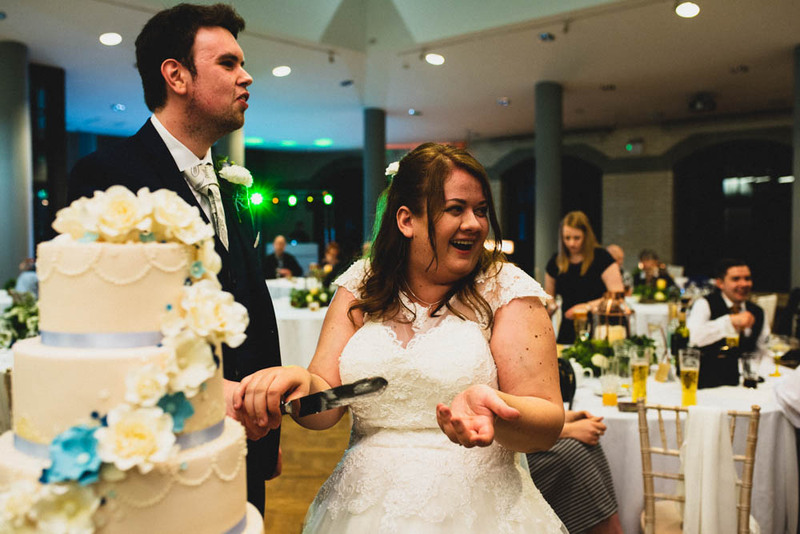 We couldn’t believe on the day how it looked – she’d created it so perfectly and it even spun around so people could see both sides. 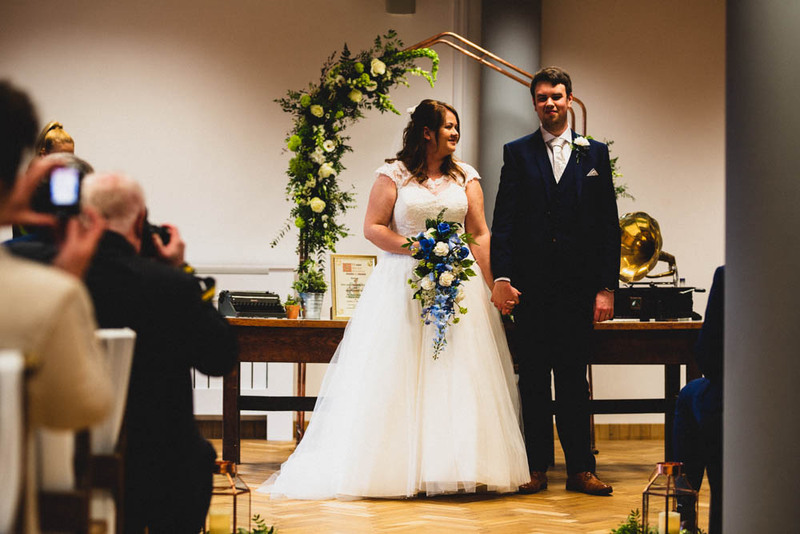 The front looked so elegant and I couldn’t believe it was all edible (the flowers were so intricate) and the back was a surprise to everyone (she’d even managed to print the sheet music of our first dance onto fondant icing!). 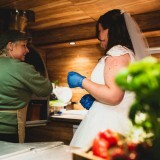 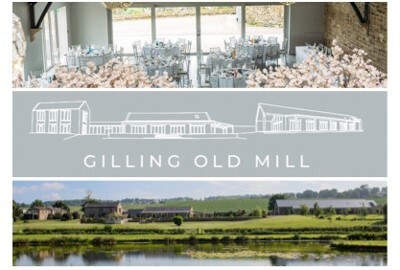 For the wedding breakfast, we worked with Gail Dandy Catering at the suggestion of the Pumping House staff. 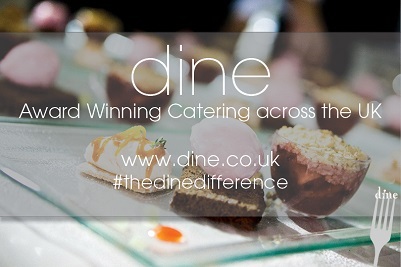 Gail gave us options and we chose to go with two options per course as we couldn’t whittle it down! 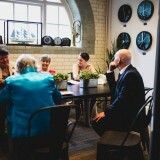 We went for food we liked rather than overly-fancy (knowing this would suit our family and friends as well): paté or chicken and pancetta salad to start, a choice of roast beef or pork loin for the main, and a cheesecake or treacle tart for dessert. 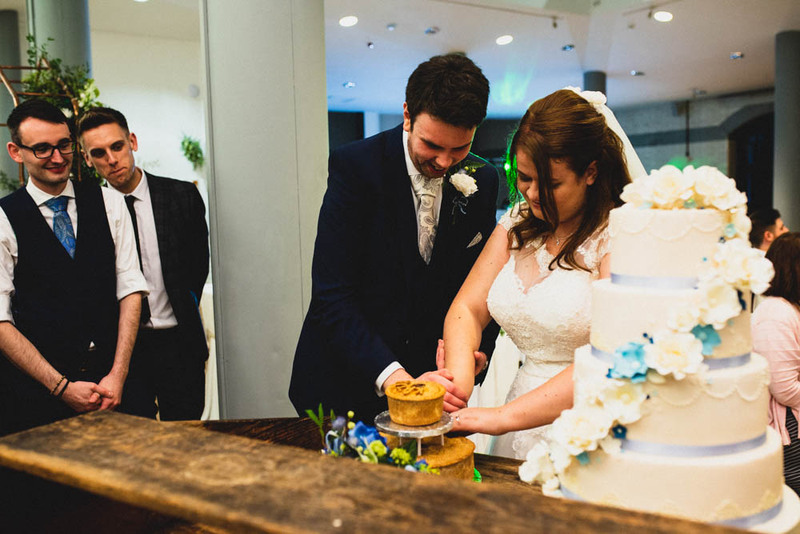 It was important to us to have the cheesecake as an option, as that’s what we ate on our first date. 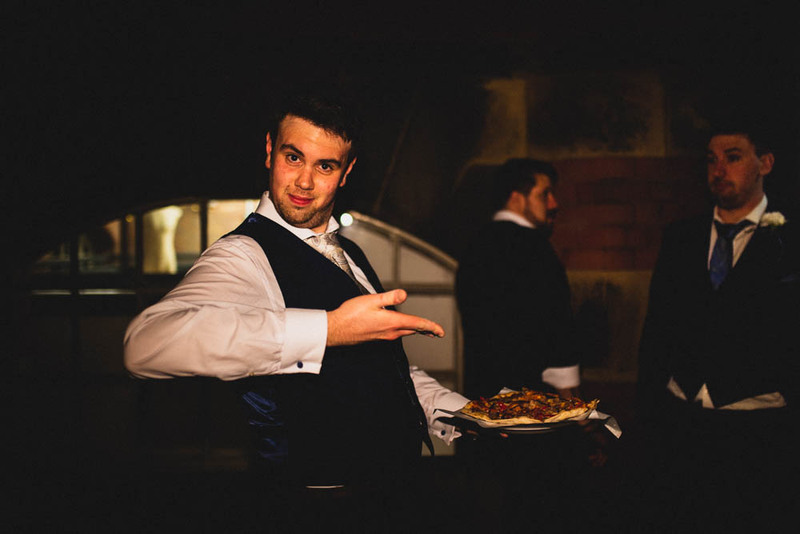 For the evening buffet, we decided to go for something a bit less conventional. 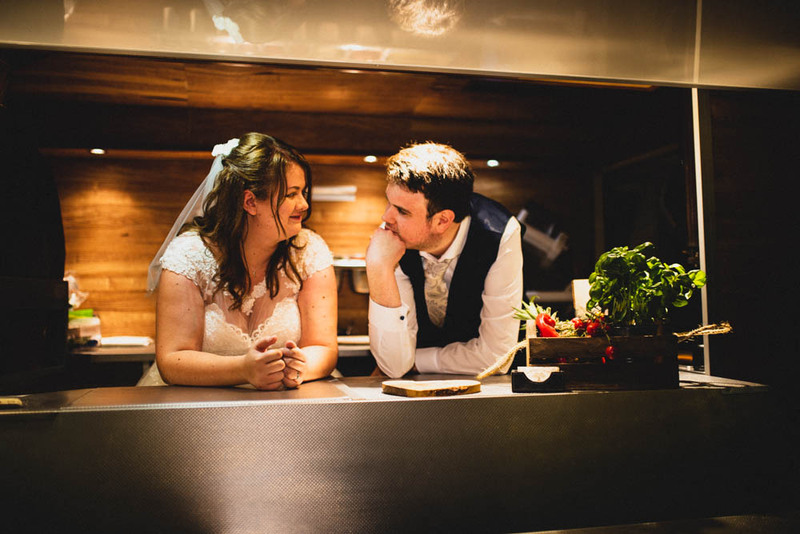 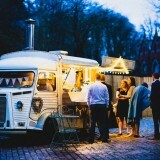 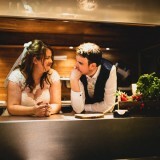 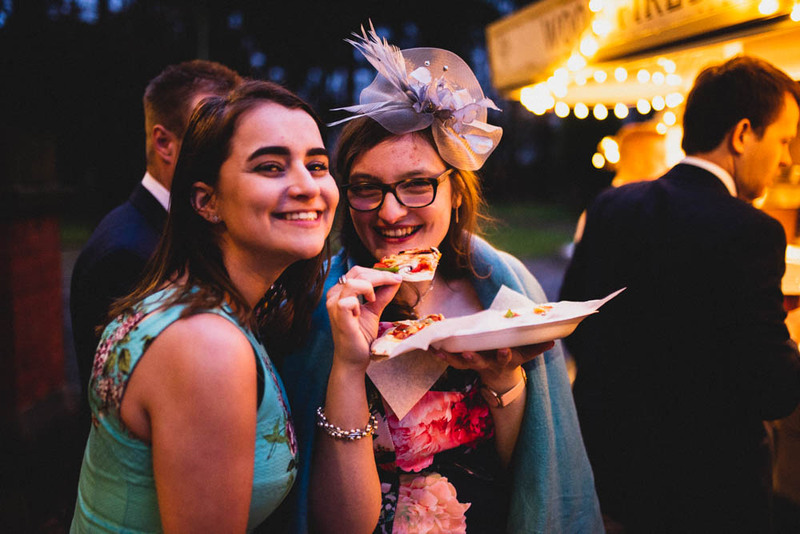 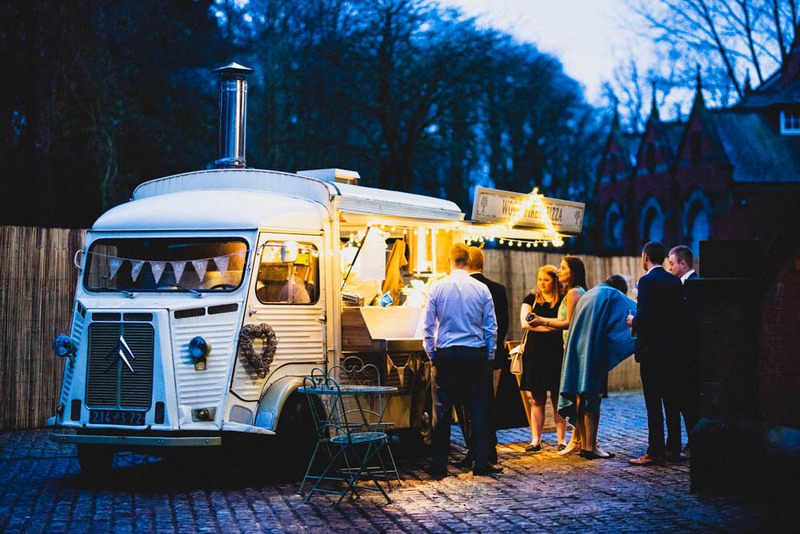 Mr & Mrs Pickwick’s traditional wood-fired pizza oven looked like it would suit the style of our wedding perfectly, and we both love pizza. 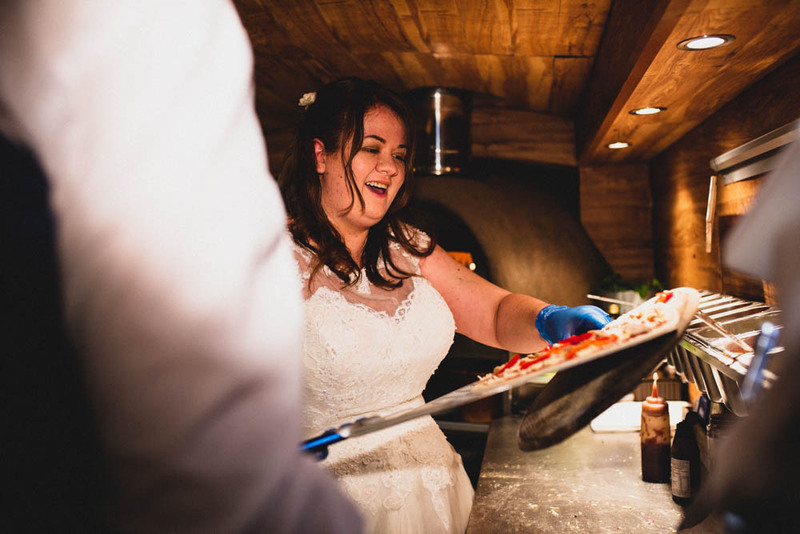 I cannot do it justice in writing – everyone had eaten well during the day and still ate at least an entire pizza during the evening reception. 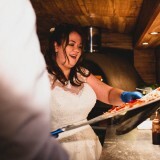 It was all made to order for our guests so they could choose what they wanted. 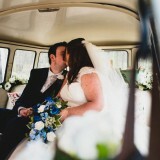 Ian and Kay were fantastic and let us go into the van to make our first meal as husband and wife. 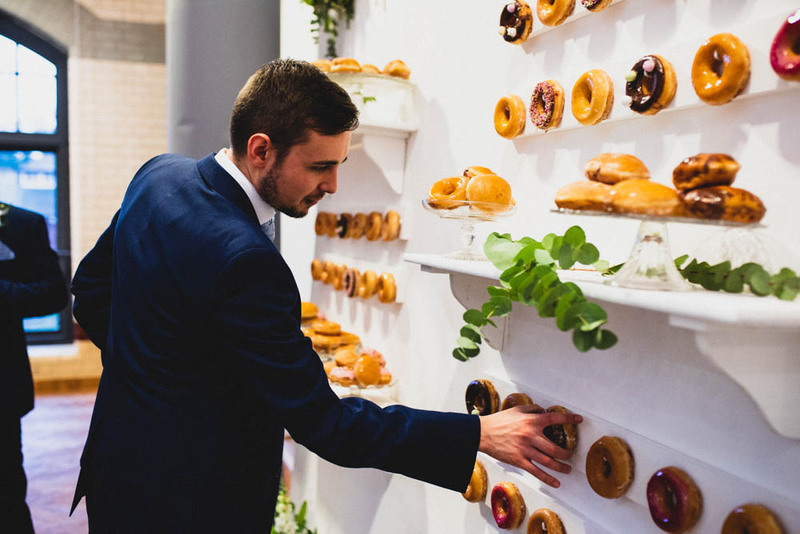 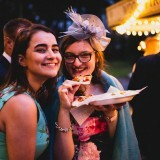 We also had a wall of Krispy Kreme doughnuts that our guests devoured over the course of the evening and, as two of my bridesmen are butchers at Westlands Farm Shop in Retford, we even had an artisanal pork pie wedding cake (which was a surprise to us on the day!). 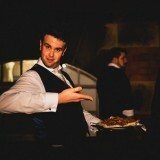 Nobody went hungry, that’s for sure! 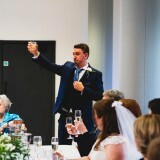 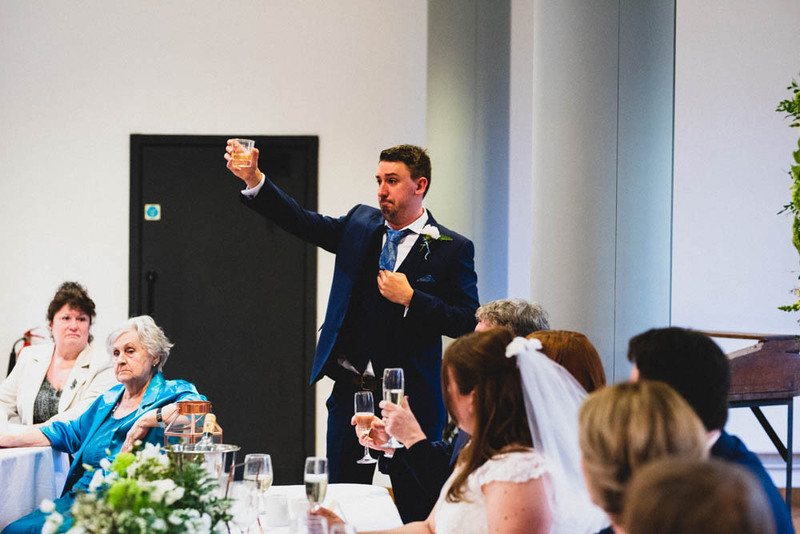 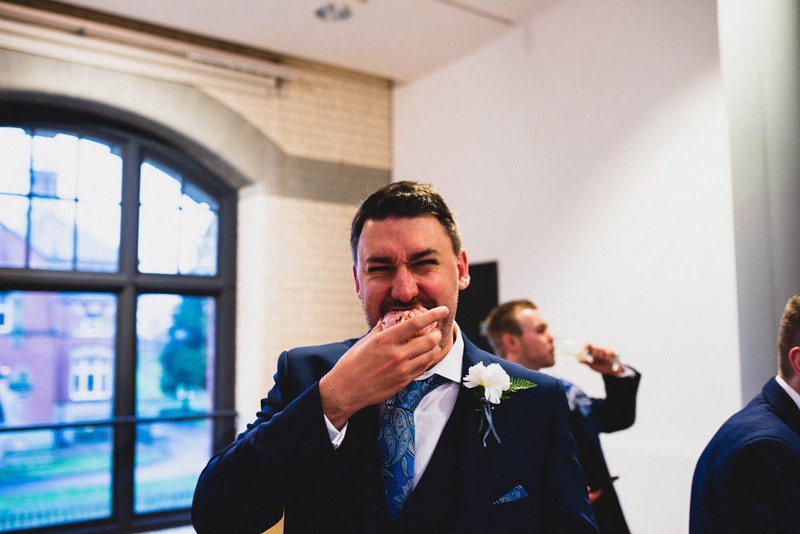 In terms of wine, we kept it simple with the meal and had a bottle of red and white on the table, and had the option with the canapés after the ceremony (even more food … I know!) 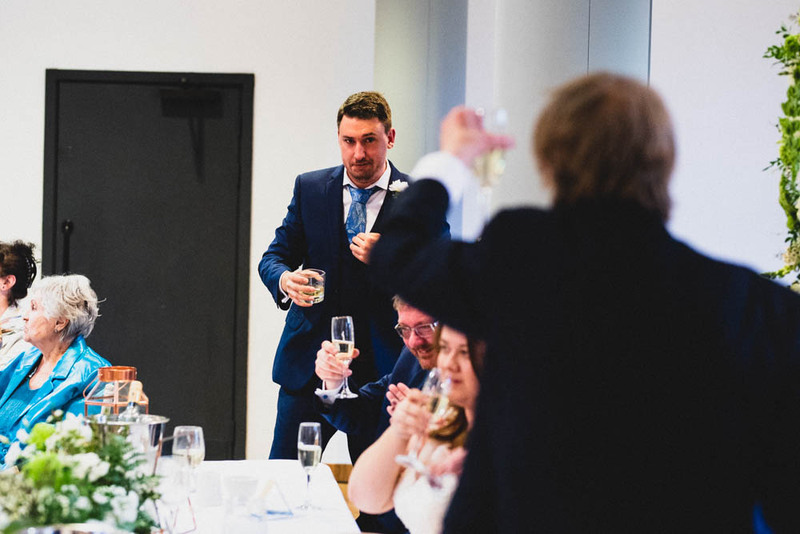 to have prosecco or Peroni, as some of our guests were definitely beer drinkers! 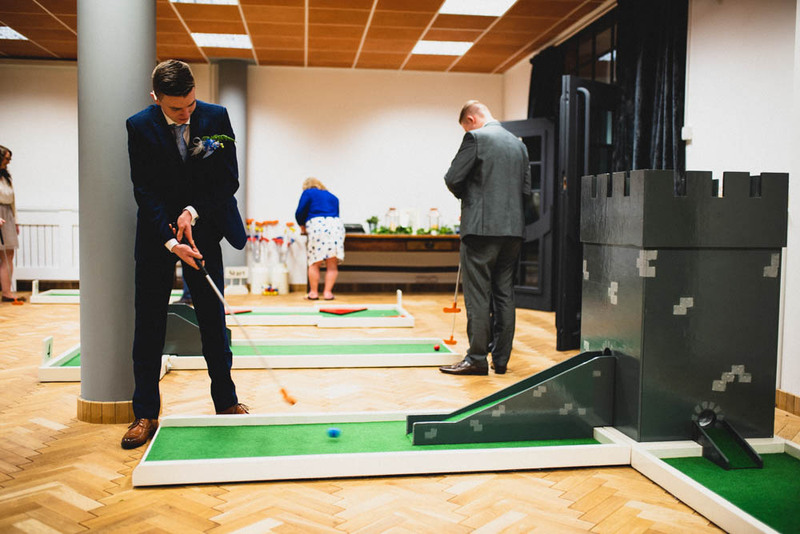 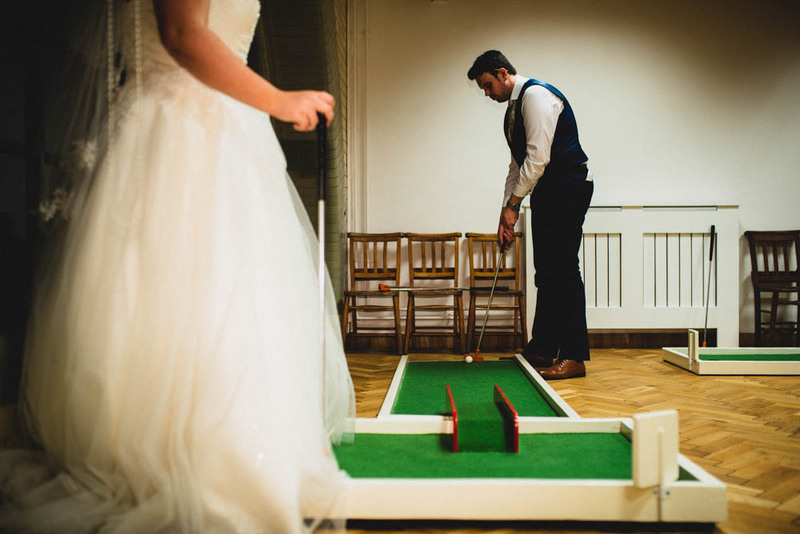 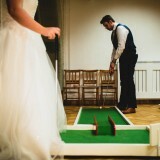 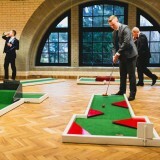 To provide some alternative entertainment, we hired 9 Hole Event Hire, which linked perfectly as our second date was at a mini-golf course. 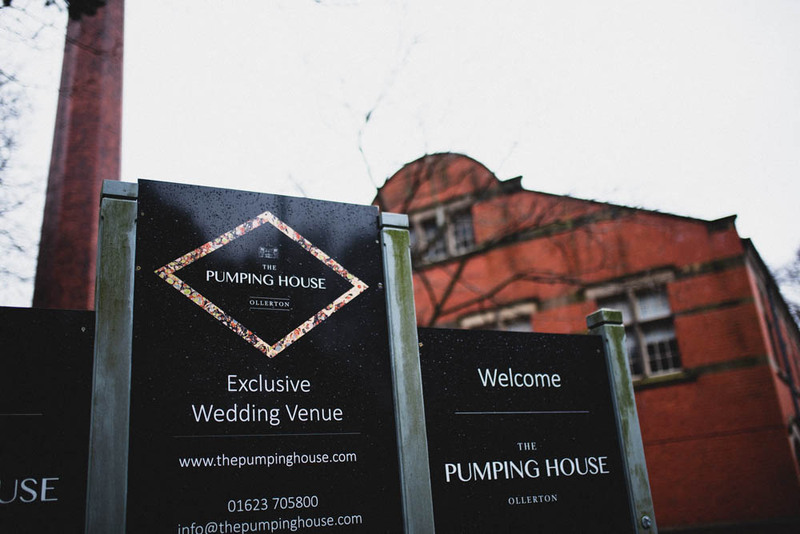 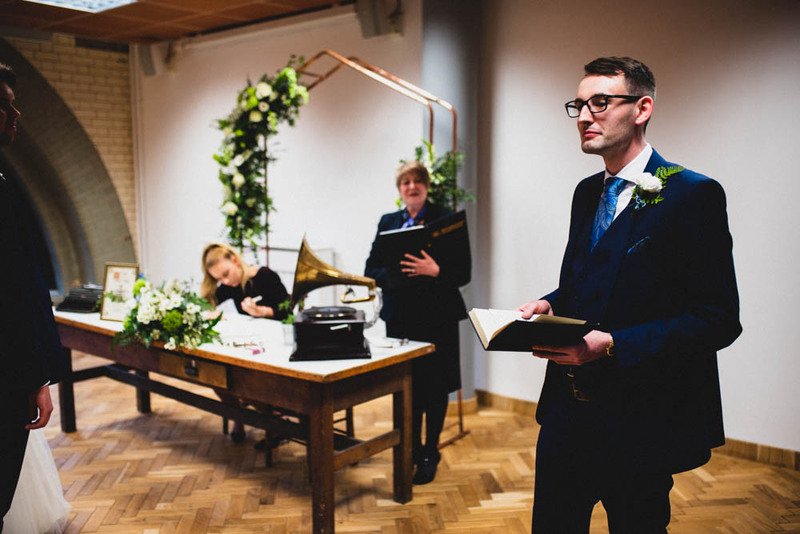 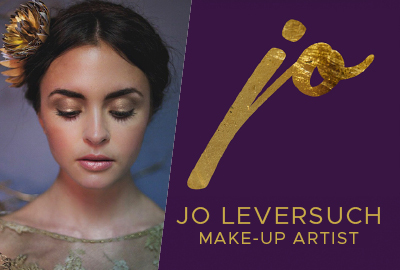 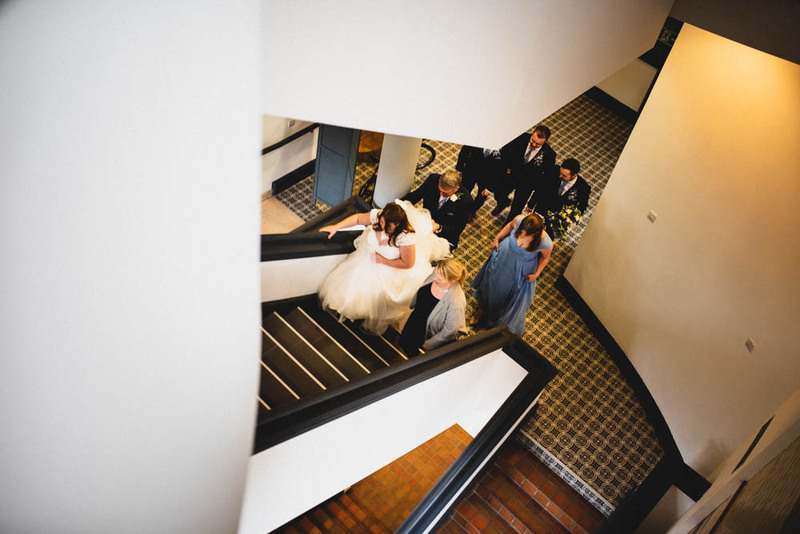 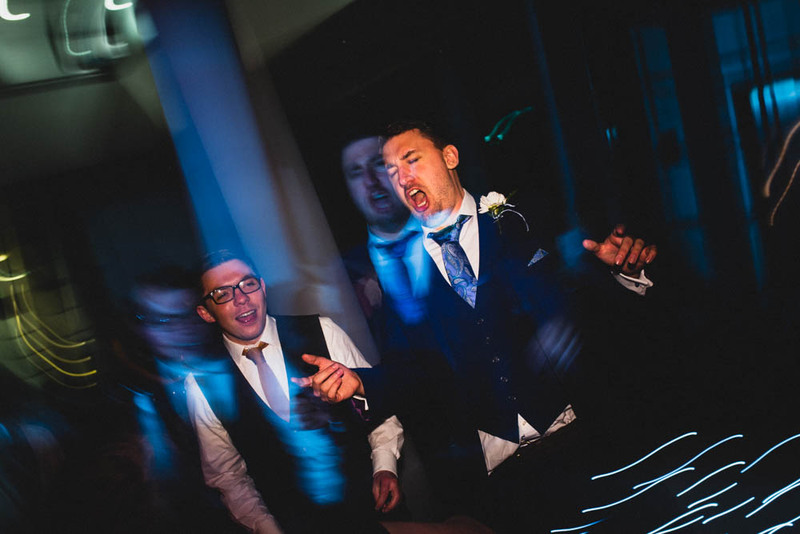 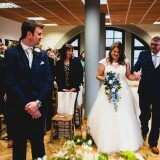 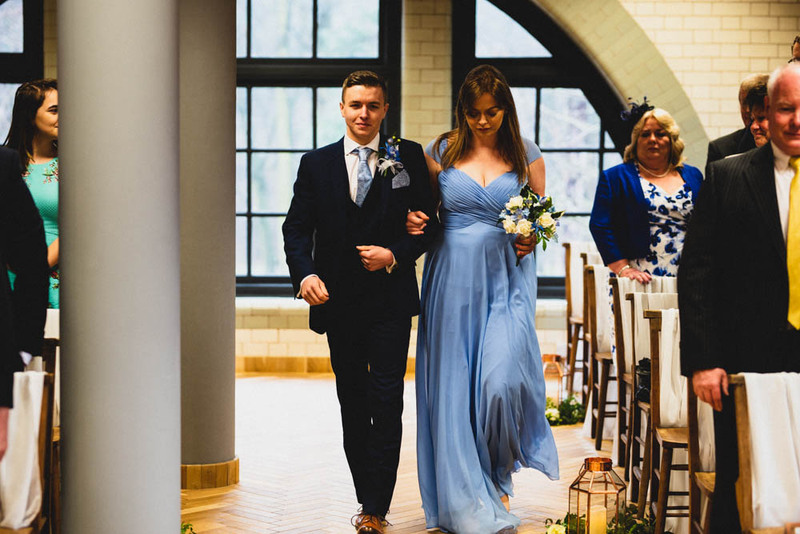 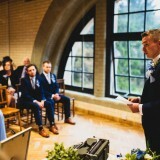 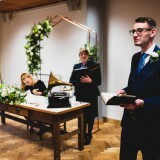 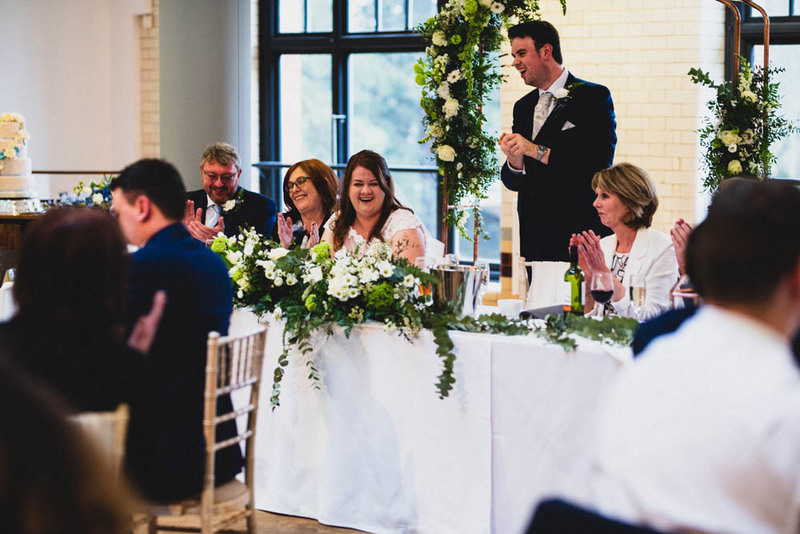 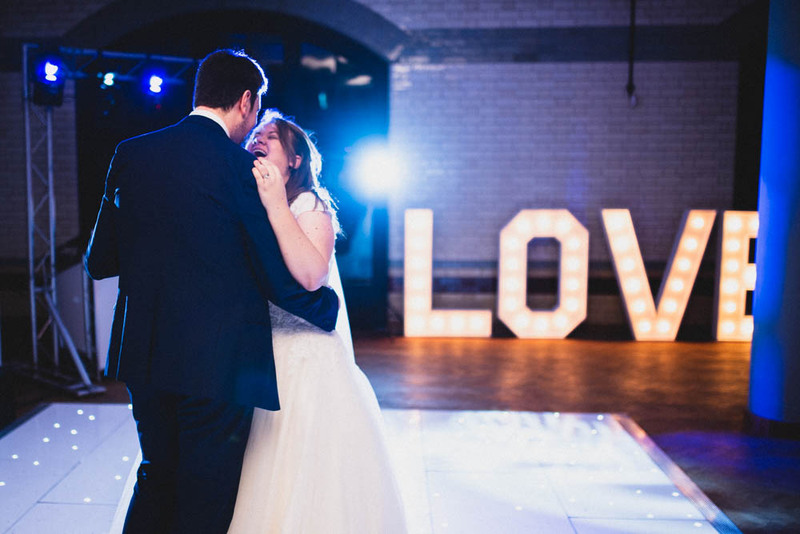 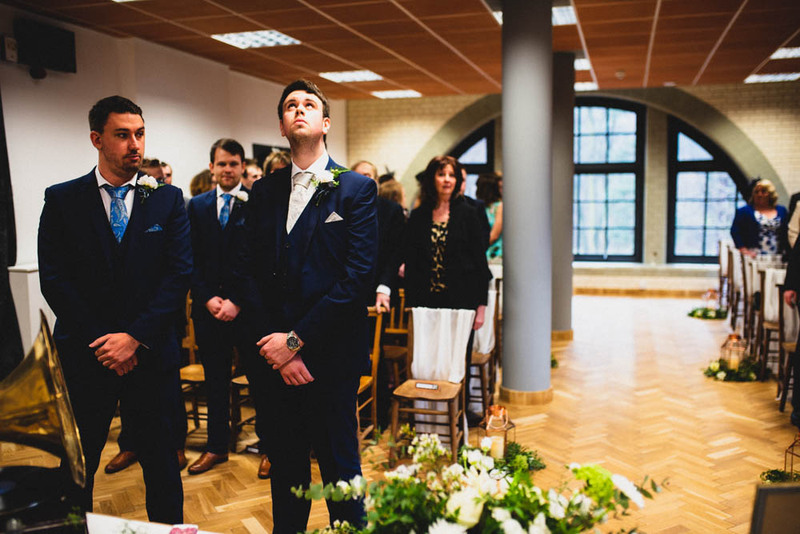 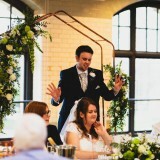 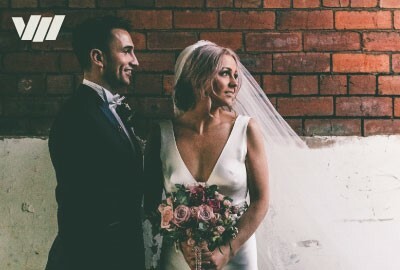 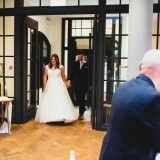 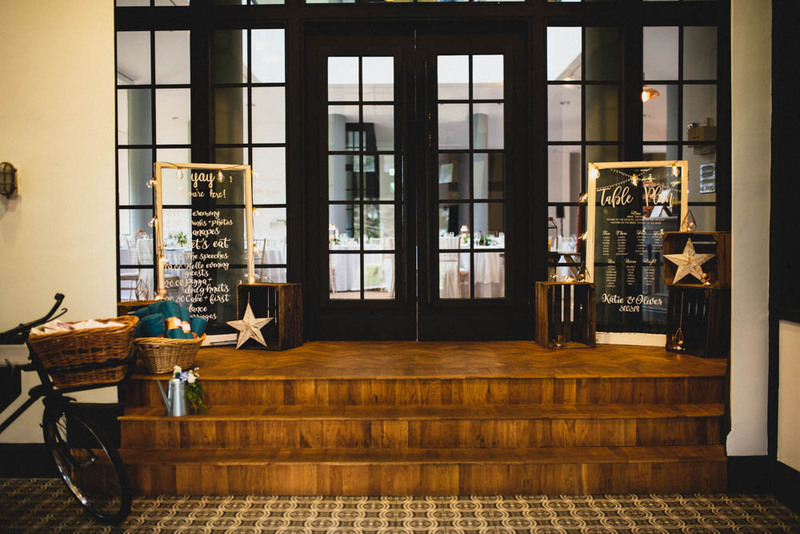 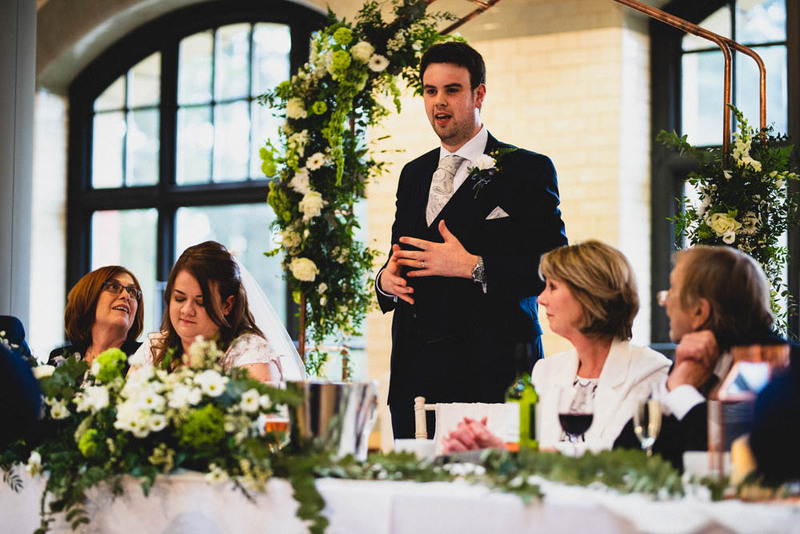 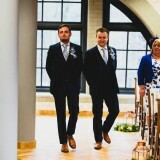 They were great – they scoped the venue out beforehand with Joanne and the Pumping House team and figured out where to set it up. 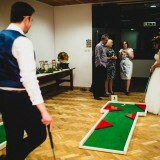 By the time the wedding breakfast had finished it was all ready to go, and every one of our guests got into the competitive spirit. 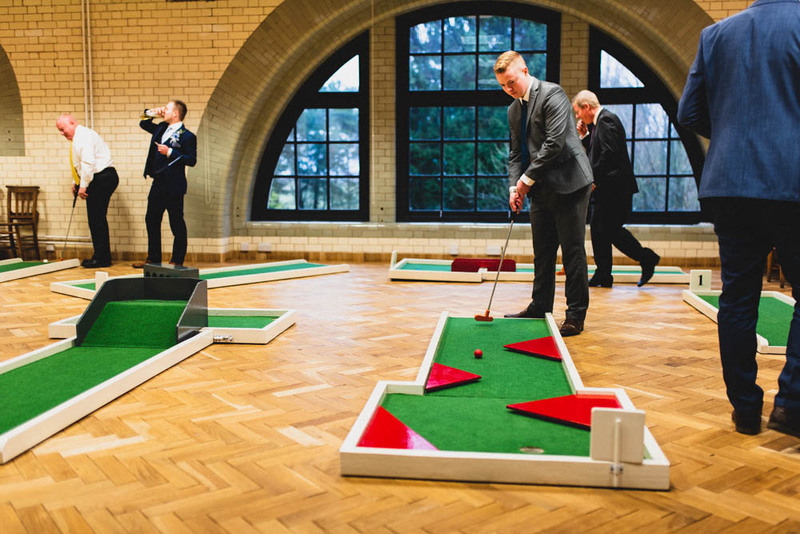 There’s nothing quite like watching everyone in their finery working their way around a mini-golf course! 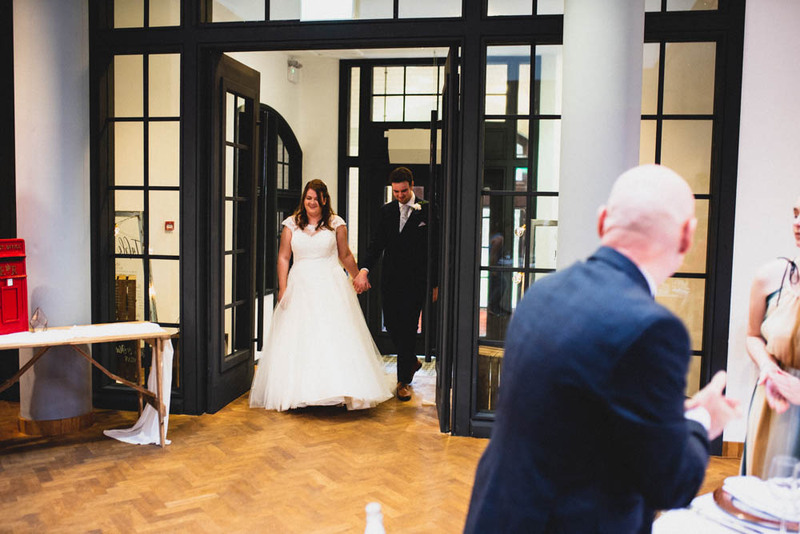 Also, our photographer James provided a stand-alone selfie camera, which our guests loved. 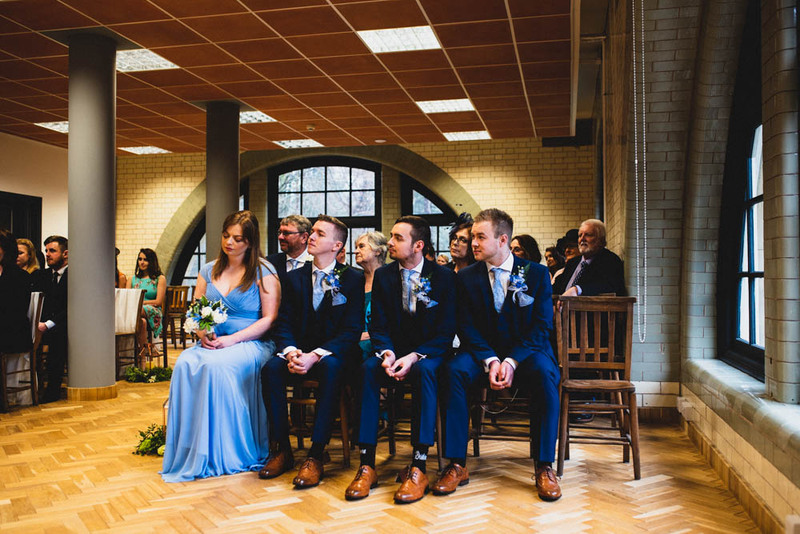 It was a really nice touch to the day, as it was in a room of its own at The Pumping House. 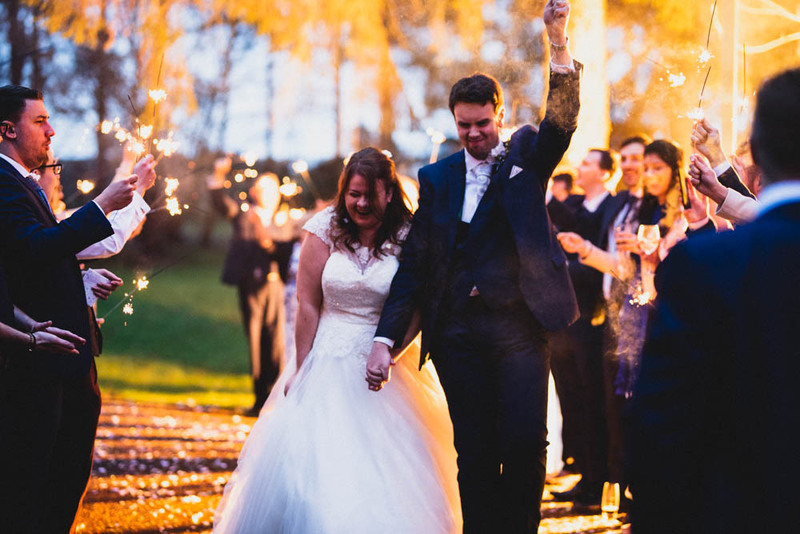 My favourite moment of the day came at around 7pm; the weather had eased up (we had rain on and off through the day but didn’t even notice to be honest!) 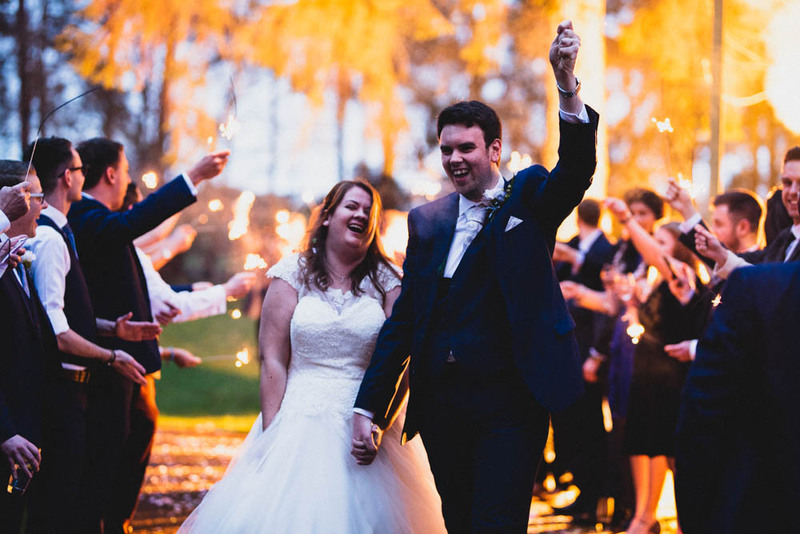 and Joanne (the venue manager) suggested it would be the perfect time to go outside with our guests, the confetti and the sparklers we had. 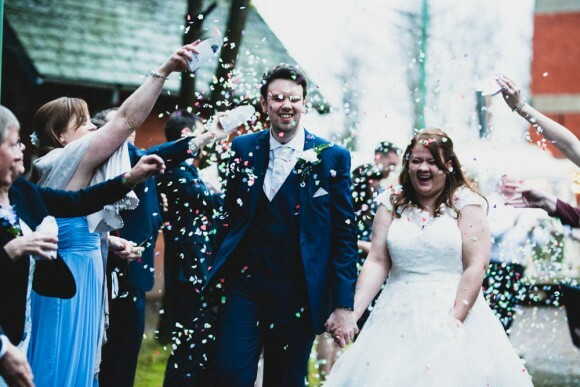 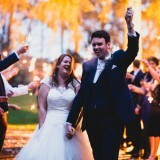 Running through the confetti and then the arch of sparklers was unforgettable for both of us – and when we saw the picture James had taken with Oliver holding a sparkler above his head and me laughing, I think it just summed up how much fun we had that day. 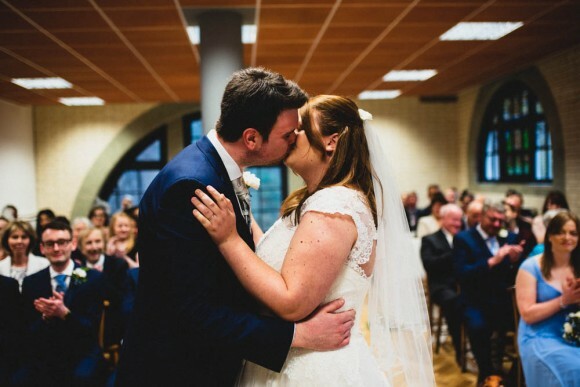 For our honeymoon, we went to Paris as Oliver wanted to take me somewhere he used to live and we both wanted to go to Disneyland! 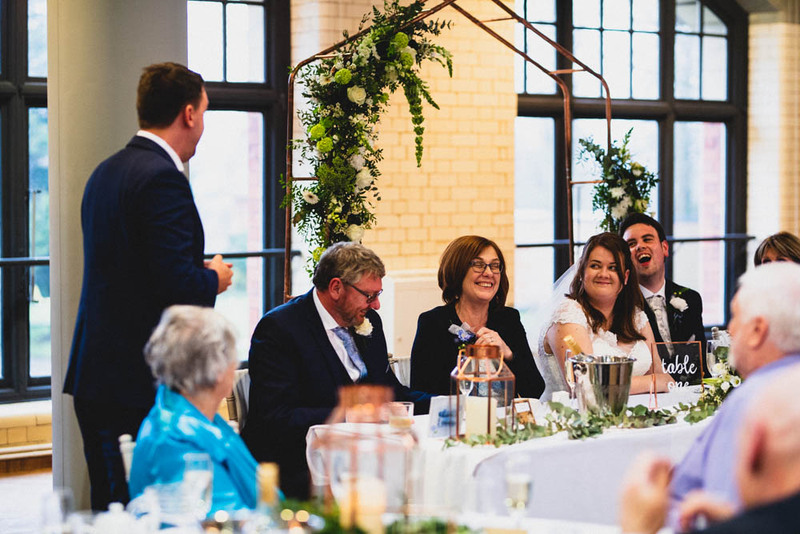 My granddad had helped choose a hotel before he passed and, when we arrived to discover our own roof terrace in the city centre, we both had a moment. 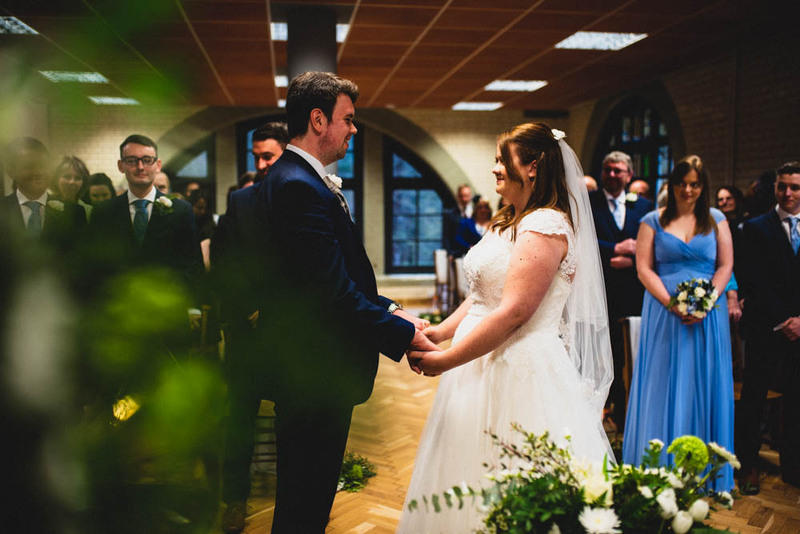 It was perfect – we were either in Disneyland or exploring the sights of the city for six days and, with beautiful weather, it really was bliss. 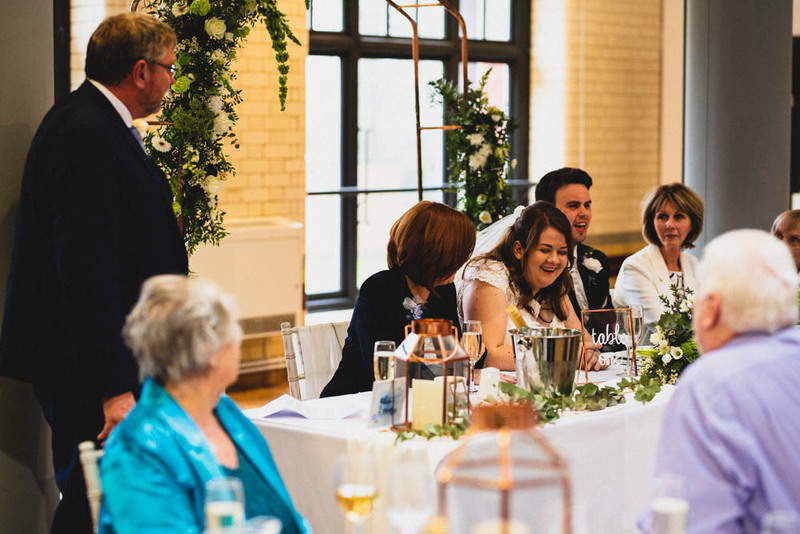 My top tip for other Brides Up North is to make sure the day is what you want: we didn’t consider what was on social media, what people might think of our choices and how our guests would react. We planned a day that was perfect for us and because it was clearly what we wanted, everyone else loved it just as much as we did. 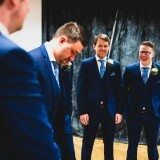 That and: don’t leave ten men to go for suit fittings together. 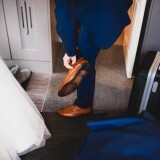 Shifts are key!